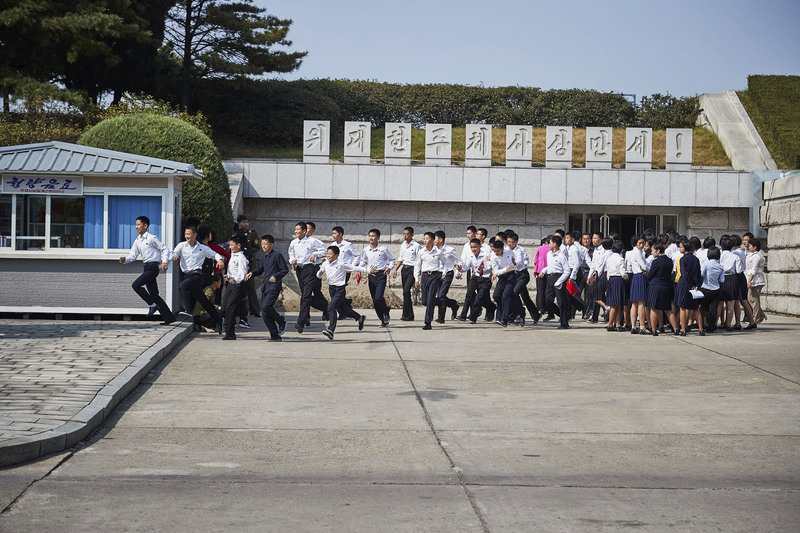 Many visitors to North Korea often feel like they’re not getting the whole story. Yes, traveling to the country on the many tours available can offer a unique look at the country not accessible from abroad. But the carefully managed and organized tours, combined with the ever-vigilant minders, mean that there’s often a sense you’re not getting the full picture. 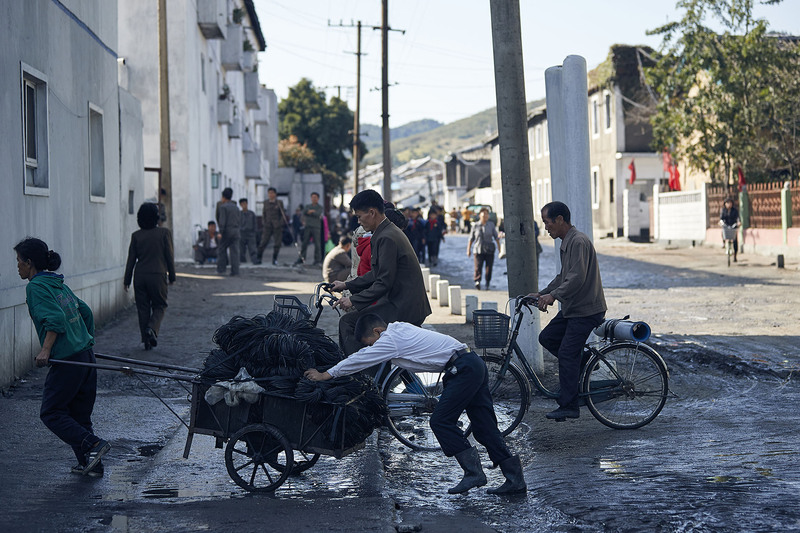 You’re usually getting a government-approved narrative, and with interactions between locals and foreigners strictly controlled, hearing from ordinary North Korean citizens about the reality of their day-to-day lives is a rarity. But what if you could tour North Korea’s capital and other major cities with a regular North Korean citizen, not a guide, contextualizing the sites and sounds of Pyongyang within their lives and experiences? 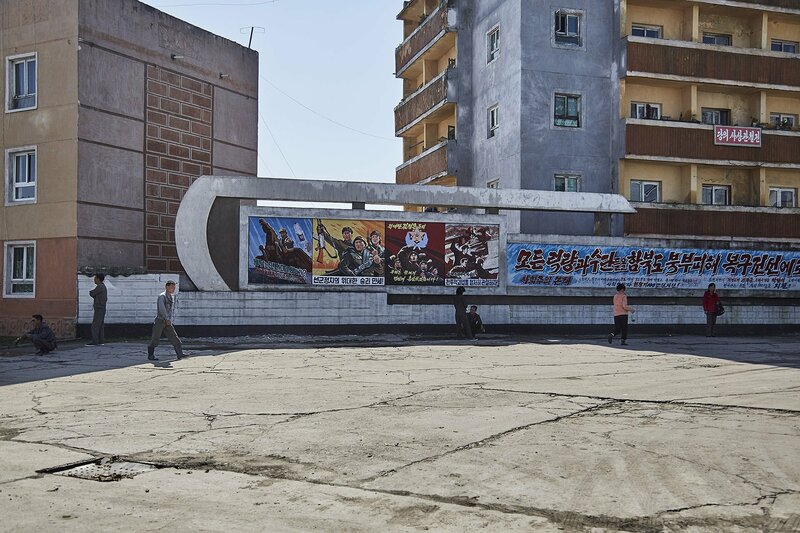 This is what NK News has tried to do, showing 94 photos taken this year by photographer Chris Petersen-Clausen to former Pyongyang residents to see what they can tell us about their hometown, what’s changed since they left, and what their memories say about the reality of life in North Korea. 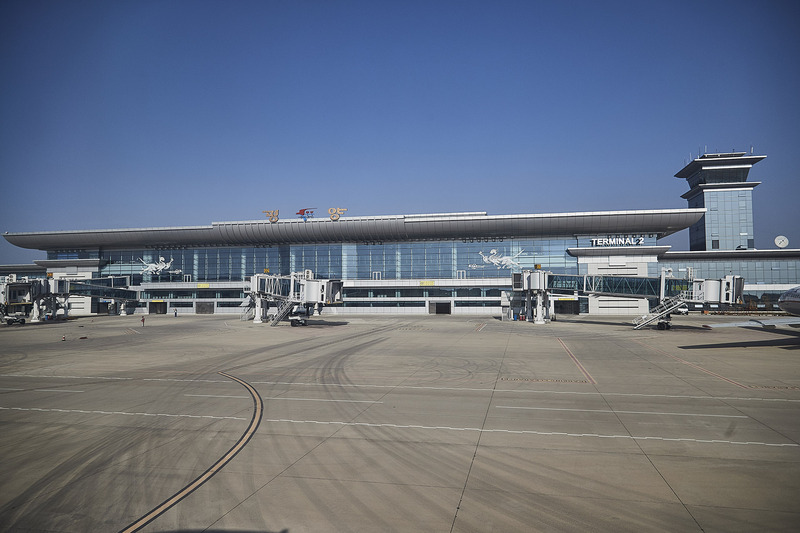 Pyongyang's recently modernized Sunan airport, where the majority of foreigners arrive, "is likely to be one of the few things in North Korea which would not require renovation in case of unification," says Tertitskiy, a Russian North Korea watcher. "The previous airport was very old, so it took a lot of time to board the plane or to go through customs inspection," Han Song Chol adds. 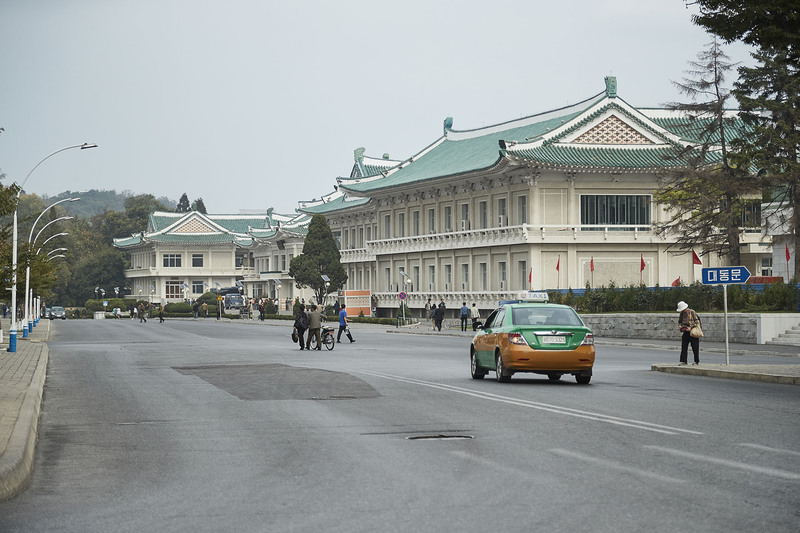 "Back when I was in Pyongyang, all of the taxis in the city were old-style Volvos," says Kang Jimin. 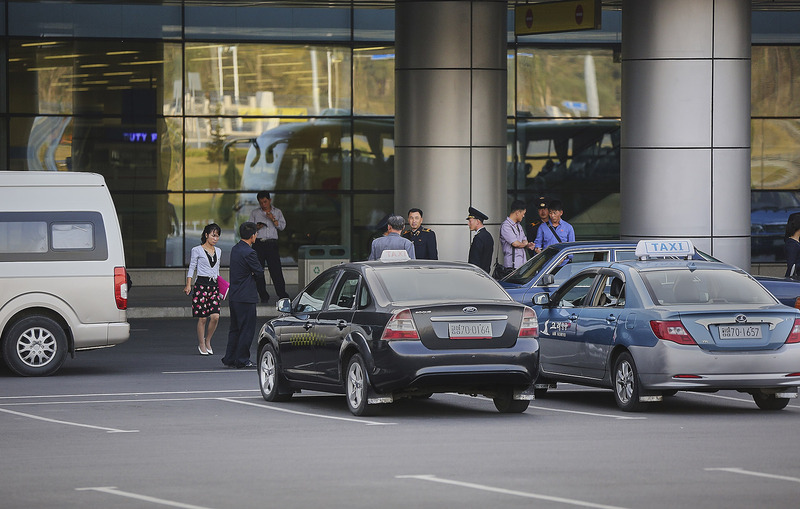 "They were all old, and were not so attractive...It is surprising to now see American cars - of the sworn enemy of the DPRK - being used as taxis." "The men dressed in black uniform are navy soldiers," Tertiskiy explains. "Judging by insignia, the man in the left is not an officer. That, however, does not mean he is not from elite: children from top elite still have to serve for a few years." 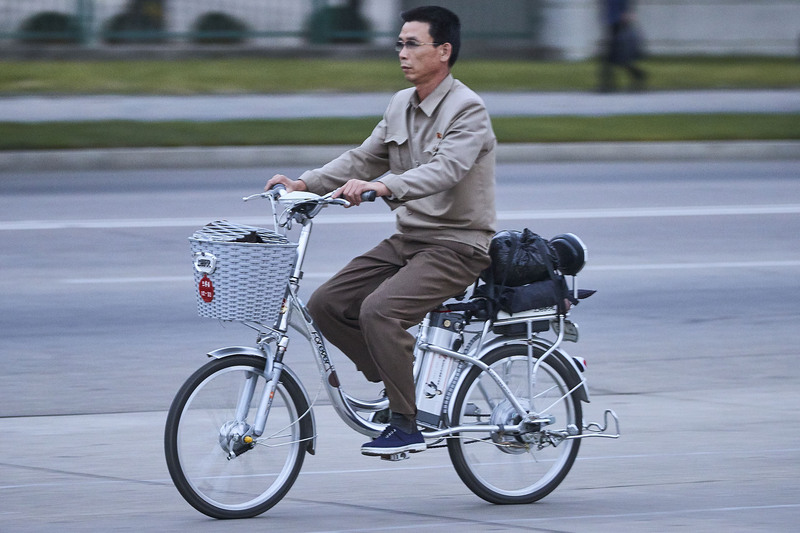 "Even now, (as seen in the photo) Japanese-made secondhand bicycles are the most important means of transportation for North Koreans," says Kang Jimin. "Look at the Chinese motorcycle that the DPRK official is standing next to, and that ROK-made cultivator that the farmer is driving... I just hope that North Korea gets better over the time." "Those students may be in their high school's brass band," says Kang Jimin. "There were times when they played the drums and blew trumpets on the way to school." 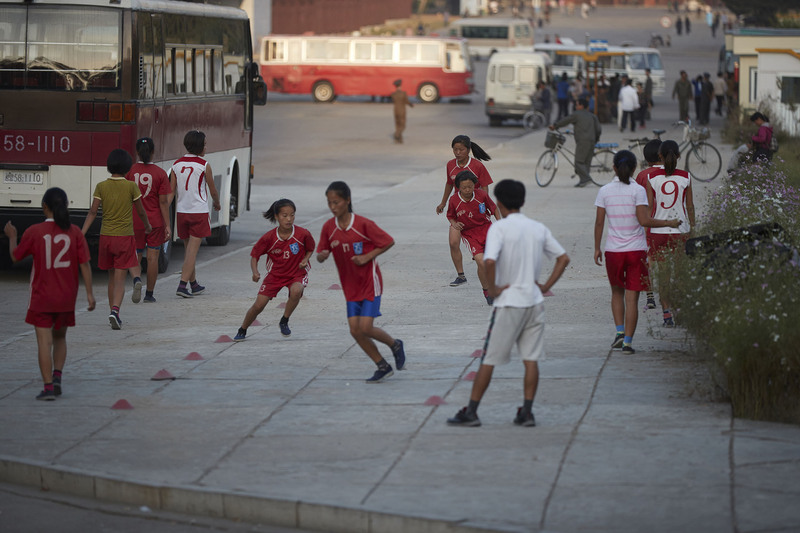 "Looks like these girls are in a North Korean varsity sports team," says Han Song Chol. "They are training with sneakers instead of proper training shoes. "My cousin used to train in the 425 soccer school, and they have to pay for their own training shoes as cleats run around 100 USD. Members usually buy cheaper sneakers but they don't last long as the quality is not that great. "There was once a time when DPRK female soccer players used to rock in the Asian region," adds Kang Jimin. " As seen in the photo, they have no choice but to train on the asphalt or dirt schoolyards like that instead of in a proper lawn." "This is Seosan-dong, Taesong-guyok," says Han Song Chol. 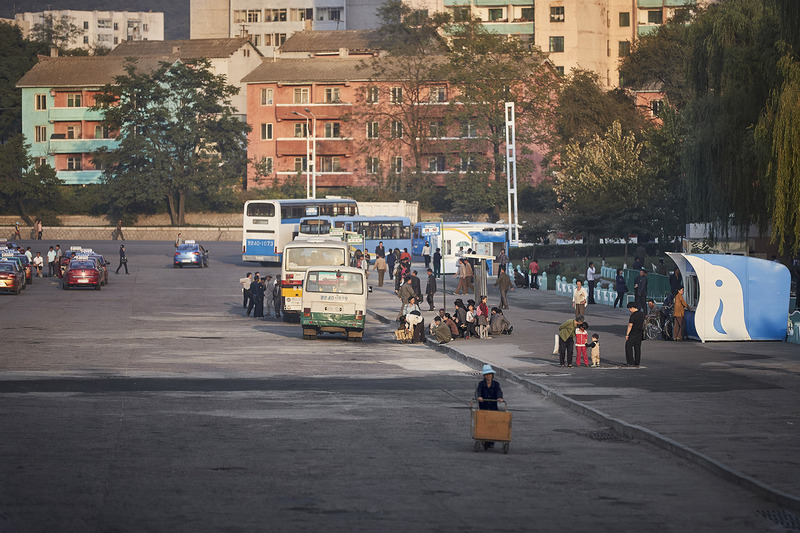 "These buses are for the merchants who are trying to go in the Sunan or Ryongsung direction, North of Pyongyang. To go to those regions, they would have to wait here for the buses or taxis. 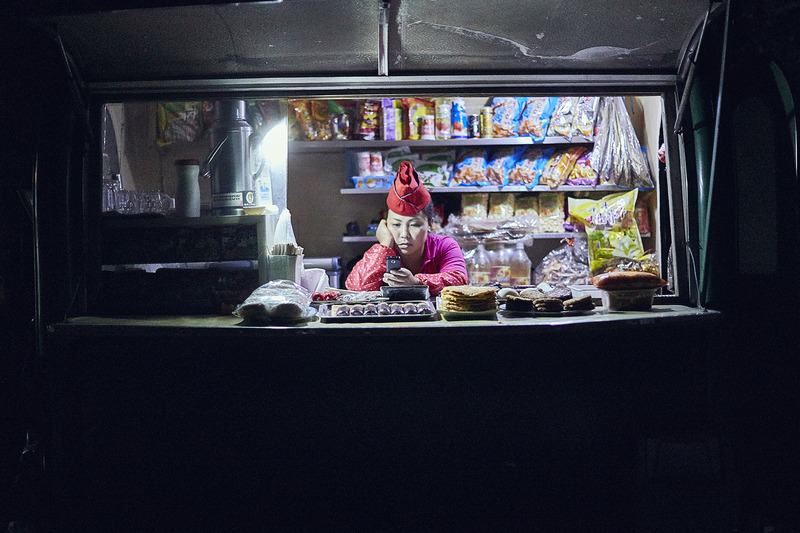 "In 2014, the trip costed about 4000 North Korean won on the bus, and around 10 USD for a taxi to Sunan." 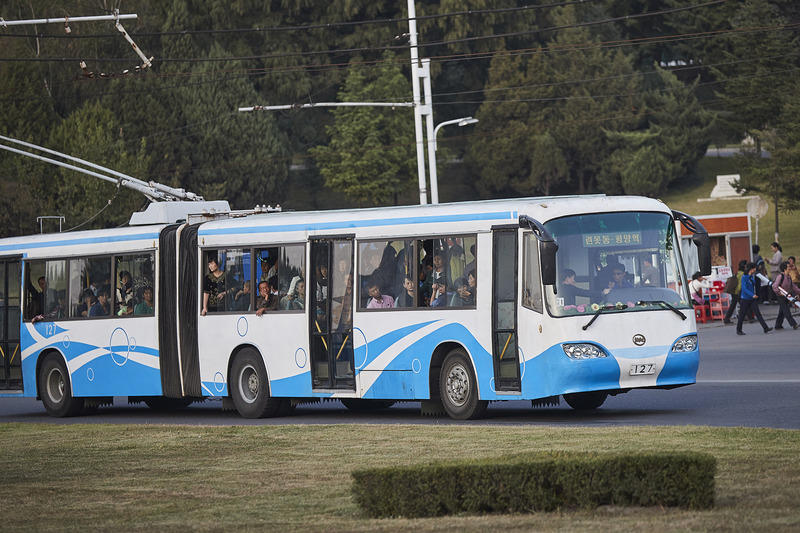 "This is the bus that drives from Taesŏng-guyŏk to Munsu Water Park," says Han Song Chol. "Usually, an express bus like this operates only in the morning, evening or the rush hours. But as there are many guests visiting the water park, it operates during noon as well. "However, because the entry fee for the water park is so overpriced it limits access to those who are short on money from going to the pool. From what I remember, in 2014, the entry fee was around 80 thousand North Korean won, which is equivalent to about three years salary of an ordinary worker." 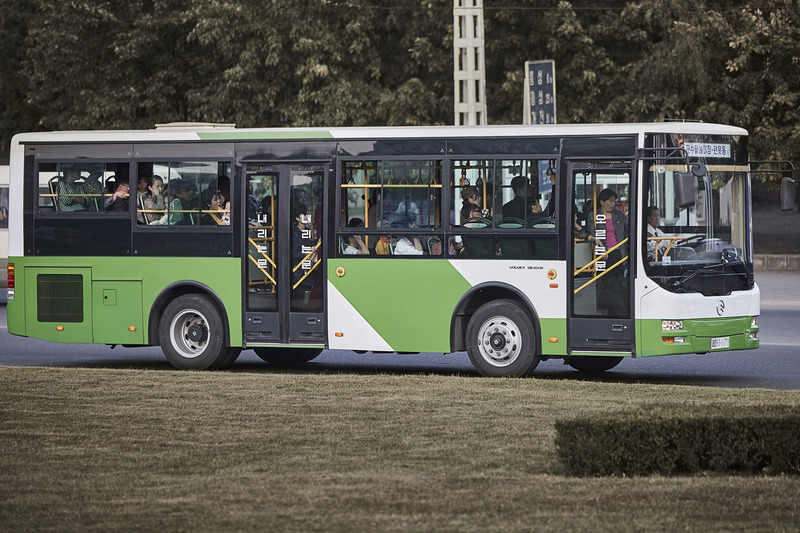 "People are supposed to get in the bus by the front door and get off using the back one, Just as in Seoul," adds Tertitskiy, the Russian expert. 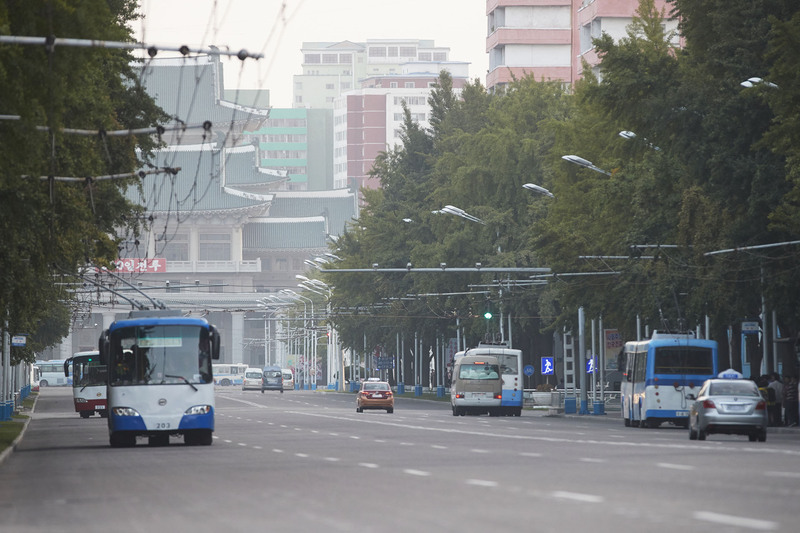 "These are trolley buses in Pyongyang," says Han Song Chol. 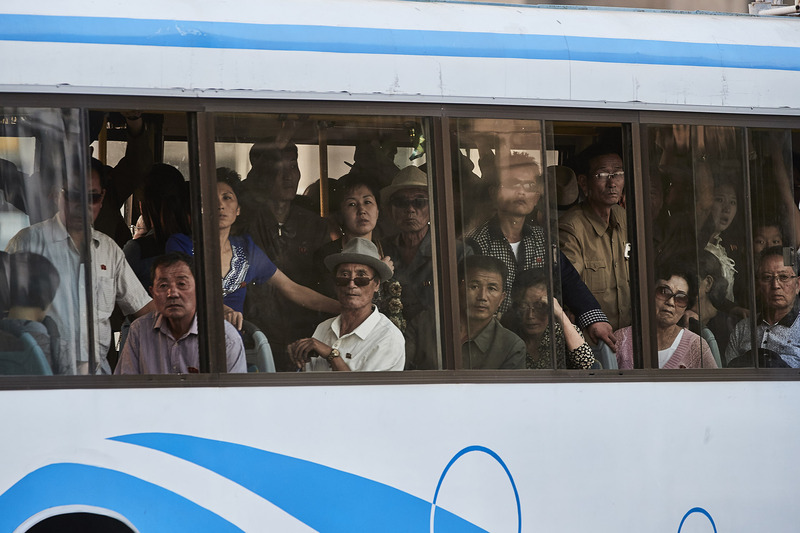 "They manage about 50 percent of the Pyongyang transport system." "This type was made in 2012, on the 100th birthday of Kim Il Sung, with parts imported from China and then manufactured in a Pyongyang bus factory," he add. "But they break down a lot from what I experienced." 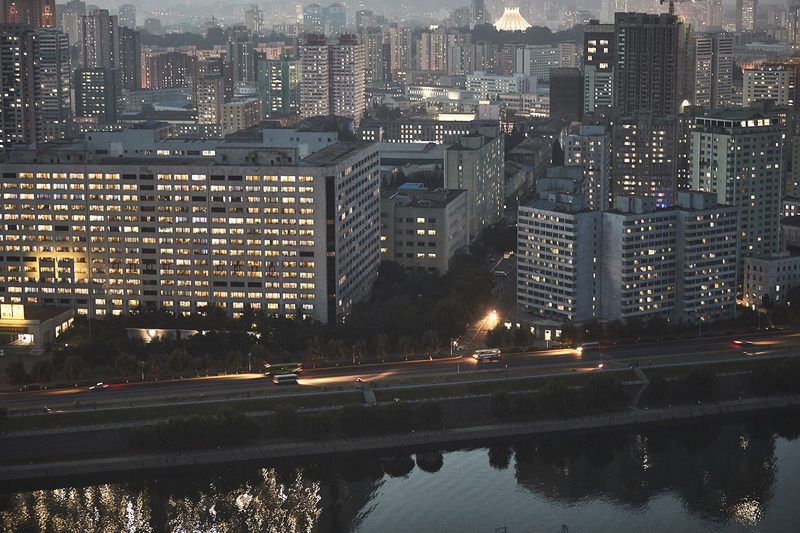 "The green building in the forefront of this picture are Kim Il Sung University faculty apartments," says Han Song Chol. Behind stand tower blocks being newly constructed as part of North Korea's 200 day speed campaign, on Ryugyong Street in northeast Pyongyang. 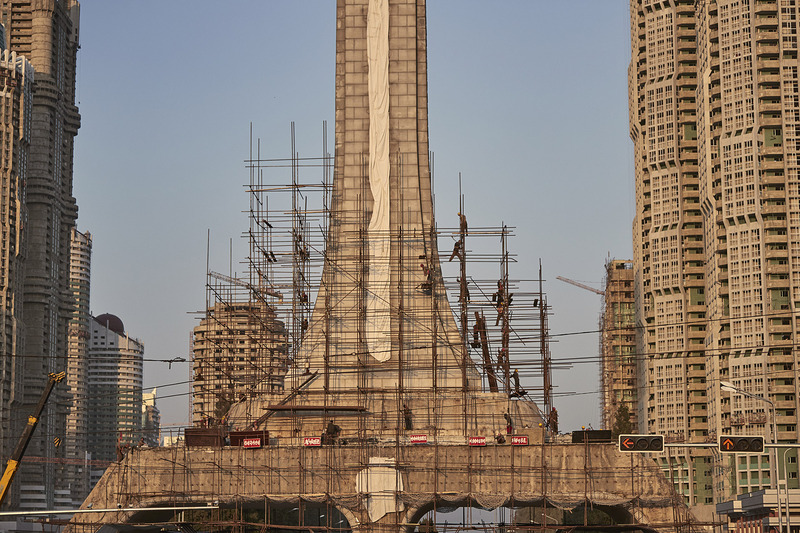 "This tower is at the entrance of Kumsung Street, and is the only arc Eternal Tower in the North," says Kim Jun Hyok. "They are changing the slogans on the side while remodeling it as well." "The inscriptions on such towers usually read: "Great comrade Kim Il Sung and great comrade Kim Jong Il are always with us!" says Tertitskiy. This particular model stands at the beginning of Ryomyong Street, where North Korean soldiers are currently working to refurbish and build over 3,000 new apartments by the end of the year. 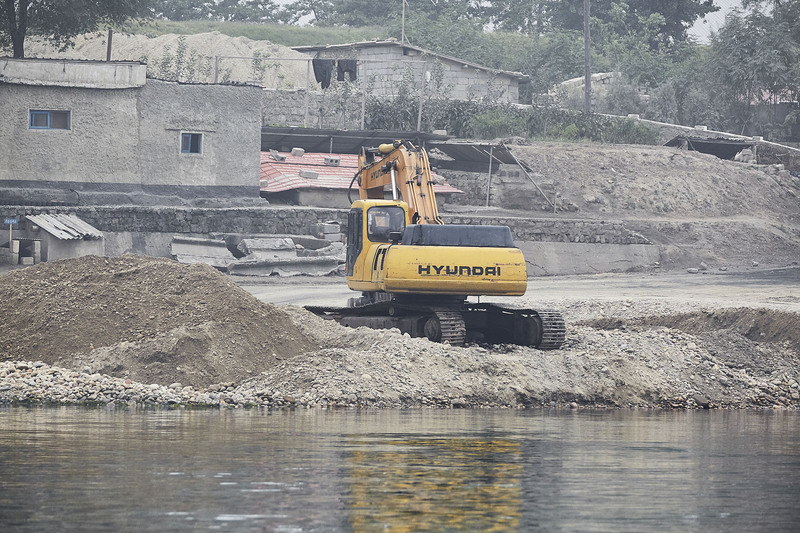 "Many accidents break out in North Korean construction zones as they do not have any proper safety measures," says Han Song Chol. "Despite the number of accidents, there are no slogans urging for better "work safety," but only the ones calling for faster (construction) speed. There is absolutely no compensation for getting hurt, or even dying while building the skyscrapers," he adds. 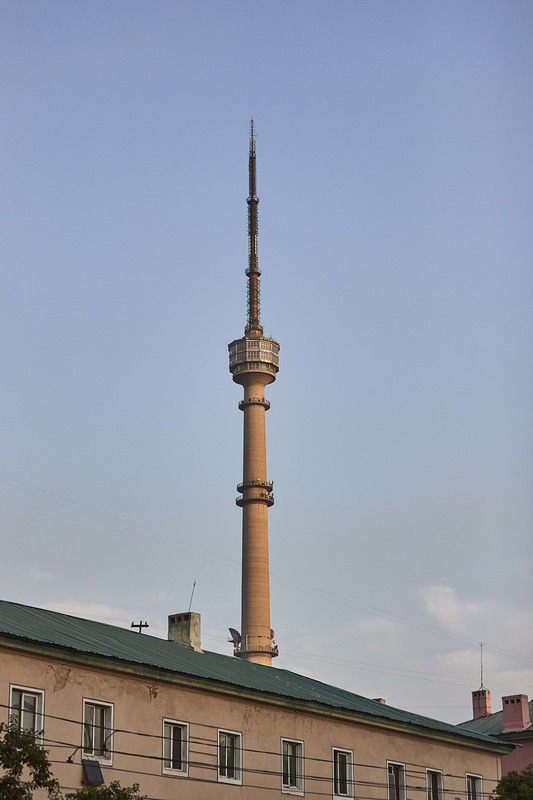 "That is the Korea Central Television (KCTV)'s broadcast tower," says Han Song Chol. 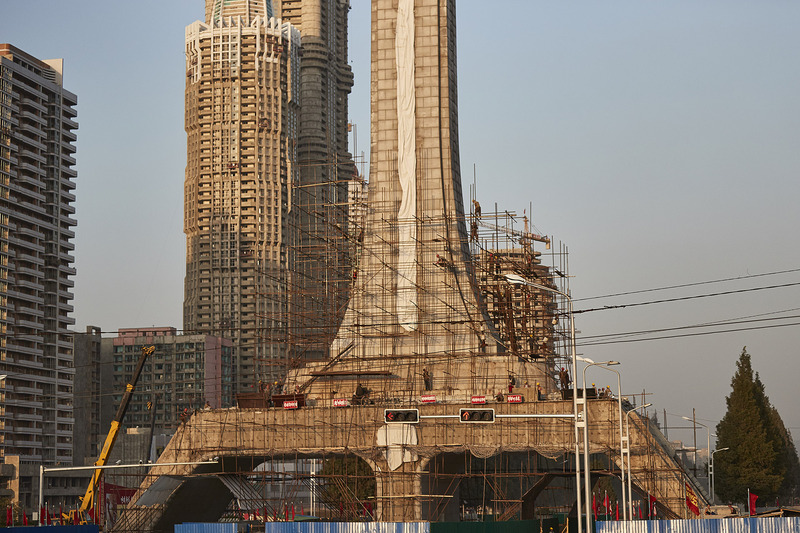 "The height of it is around 250 meters and is located at Moranbong, in Pyongyang." "I have been there before, and the building has some serious security levels. It is one of the most well protected North Korean facilities. A company of the DPRK security forces is on standby all the time." 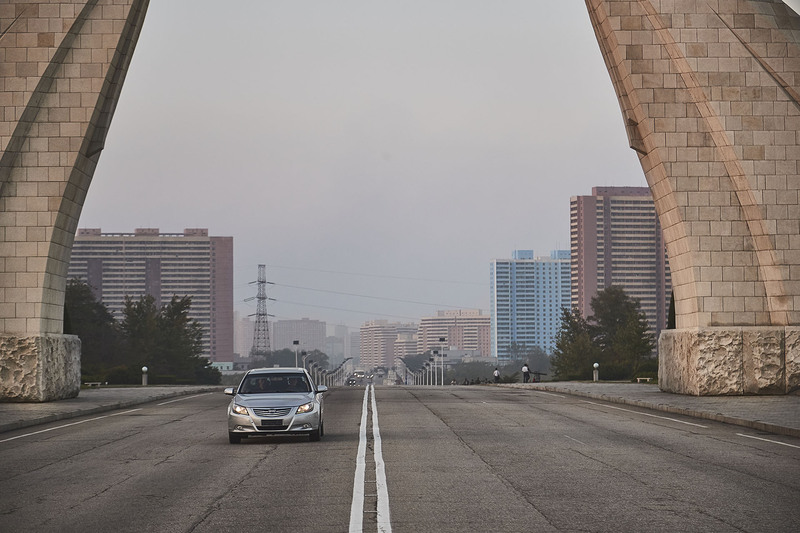 "Wow, the straight road under the Arc was only allowed for cars with 727 numberplates (North Korean elites), but that old Volvo is going straight into that structure," says Kim Jun Hyok about the image. 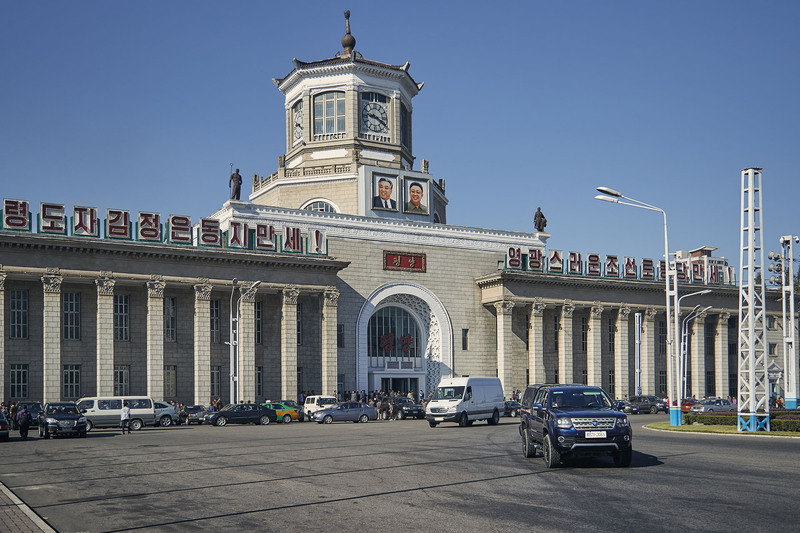 "This is an Arc of Triumph, erected to commemorate Kim Il Sung allegedly liberating Korea from the Japanese," explains Tertitskiy about the building's purpose. "It may be the biggest building in honor of event which never happened. Kang Jimin says North Koreans were unimpressed by the general the tower was dedicated to. "Allegedly, the people of Pyongyang were expecting to see a veteran general with gray hair," he says. "But the crowd was rather disappointed to see Kim Il Sung emerge, who was only in his 30s at the time and looked like a Chinese food delivery guy." 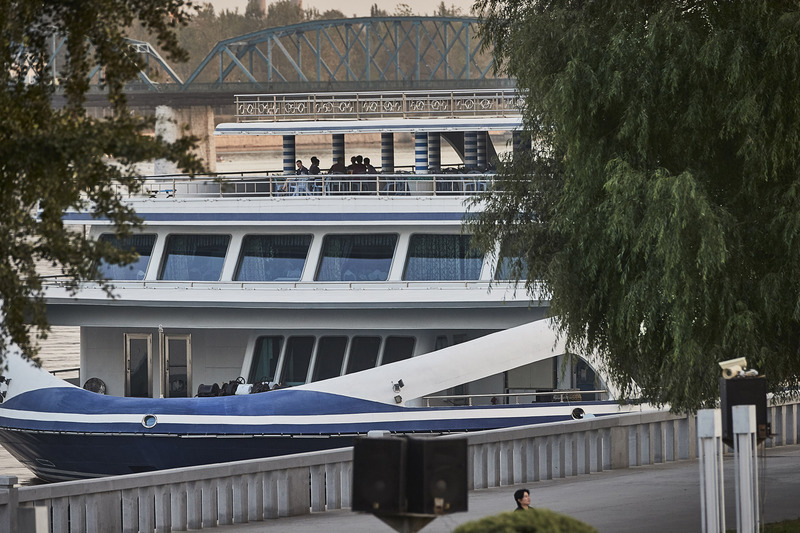 A new river boat on the river Taedong, for the richer citizens of the city as well as wealthy tourists. "It's in front of the Kim Il Sung square, the floating restaurant," says Kim Jun Hyok. "Do you see that CCTV attached to the boat?" Fyodor Tertitskiy: This is a policeman - a junior lieutenant, who serves in traffic police. The inscription on the motorcycle says "traffic safety". 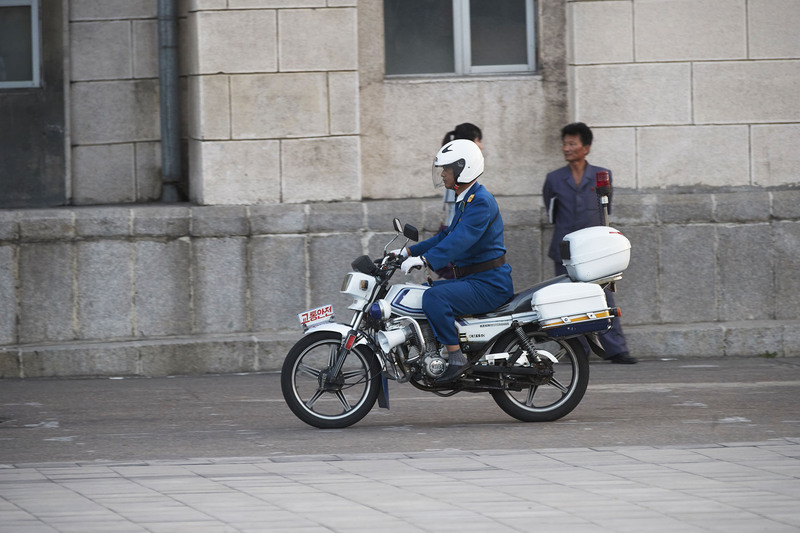 "Maybe he is the traffic police officer from Sosong-guyok, the poorest district in Pyongyang?" says Kang Jimin. "That motorcycle was supplied to the police force such a long time ago. It makes me wonder why he is using it even until now." 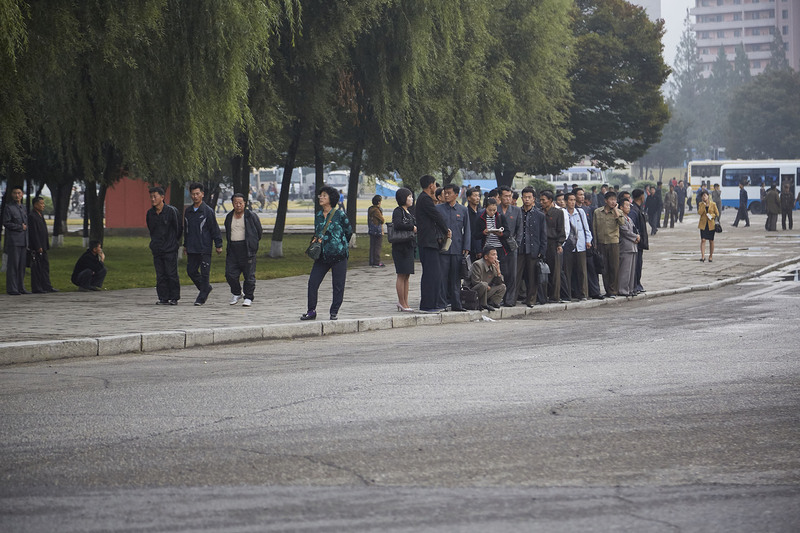 "This picture reminds me how Pyongyang used to turn into absolute mayhem during rush hour," says Kang Jimin. "There were thieves who would try to steal a watch or wallet from people. I also remember how nervous I got worrying about a power shortage and the bus stopping in the middle of the roads." Kim Jun Hyok has a different view: "The only time when North Koreans are staring at one place like that is when foreigners are passing by!" "Note the presence of the two military men in the bus," says Fyodor Tertitskiy. "The chances of meeting a man in uniform in North Korea are significantly higher than in most other countries." 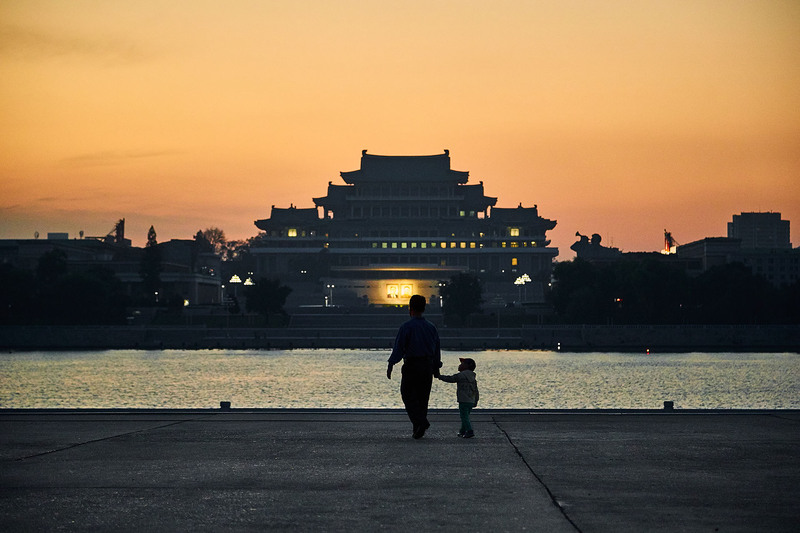 "That is the Pyongyang Grand Theatre, located at Chung-guyok," says Han Song Chol. The theatre was opened during the 1960s. "I remember how awesome they used to look when I was younger," says Kang Jimin. "Me, reaching the age of puberty at the time, would have secretly wanted her skirt to be shorter!" "That device on her waist is the manual traffic light remote," observes Kim Jun Hyok. 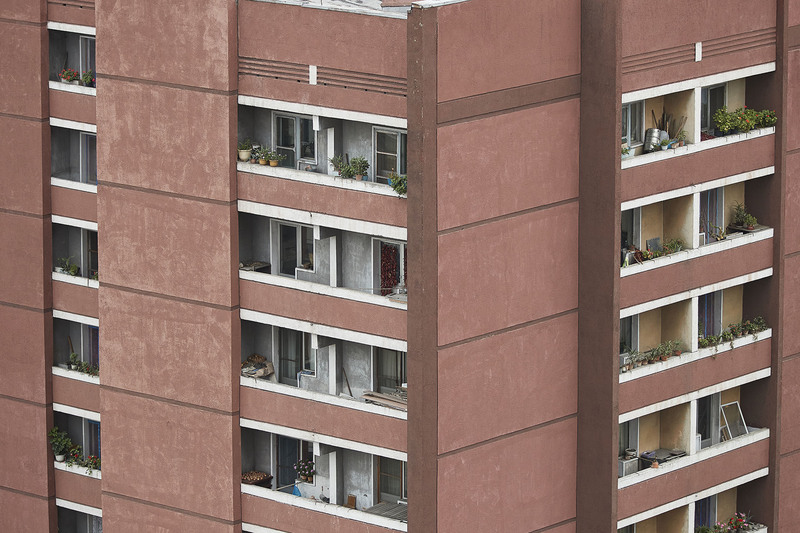 "These are buildings that weren't there when I was in Pyongyang," says Kang Jimin, who left in 2005. "I have to say that it is quite a sight!" "Back when I lived there, people used to get expelled from the city if they were caught using even an electric heater. I am certain that you will still be able to find numbers of smoke-stained windows and oblique chimneys built around Gwangbok Street." 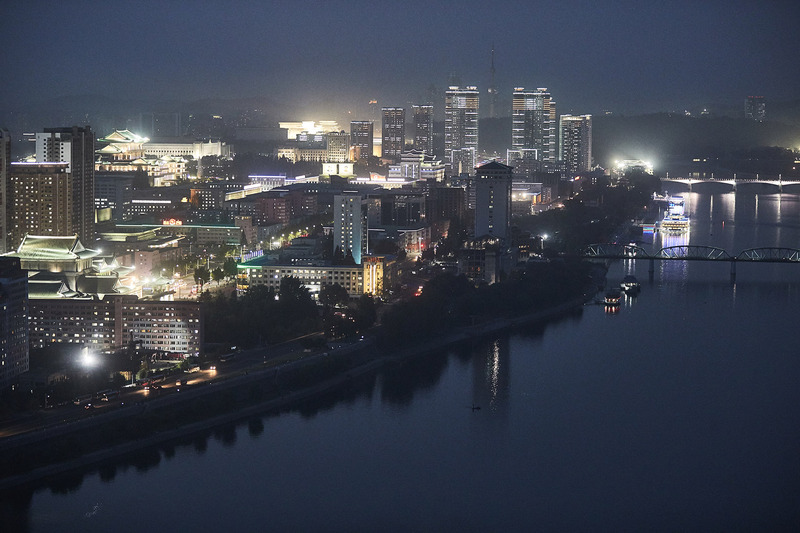 Kim Jun Hyok, who left Pyongyang in 2014 explains differently: "Do you know why Pyongyang looks beautiful during the night? It is because the city officials know “where” to turn the light on to make it look better." Lighting has improved a lot since even the era of Kim Jong Il, who died just five years ago. "I wonder if the situation with the illumination changed for the better in other places as well, or just the center of Pyongyang?" asks Tertitskiy. But Kim Jun Hyok notices something else. "See how bright these buildings are, but at the same time how dark it is behind those buildings? As you can see, "equality" is long gone even in Pyongyang, the heart of the country." 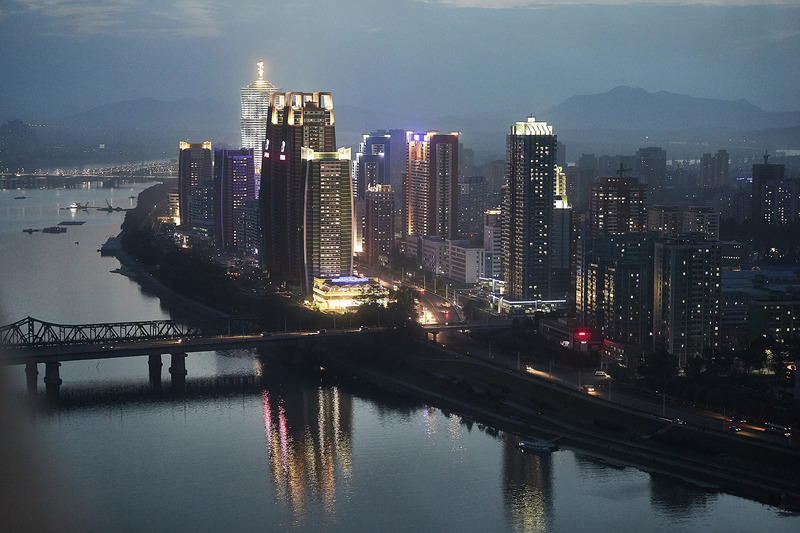 "Eastern Pyongyang across the river is usually dark," says Han Song Chol. "People from that part of the town often says that it's like living in the countryside, as they barely have the electricity." "Look at those nerds still studying late at the Kim Chaek University of Technology," says Kim Jun Hyok. "I wonder if they are still studying their material or having an ideology education session!" 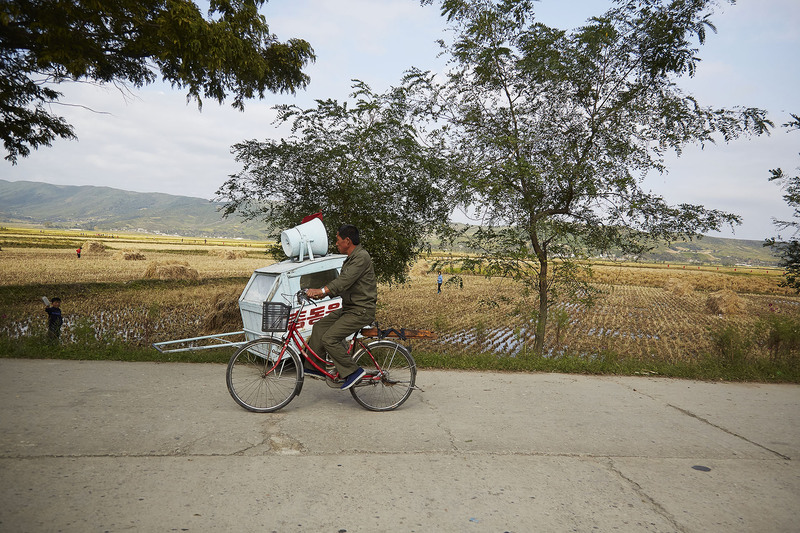 "This is a vegetable bike operated by the city's meal service management office," says Kim Jun Hyok. 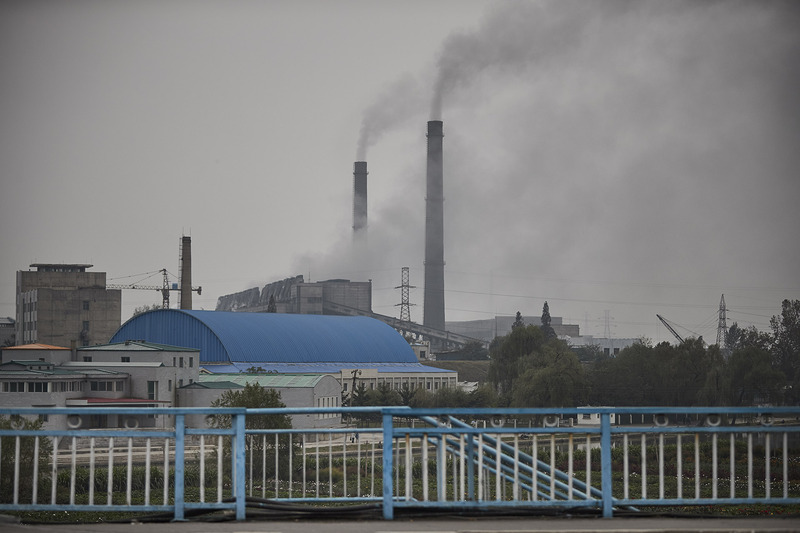 "That is the Pyongyang Thermal Power Station," says Han Song Chol. "The air-quality around this region is so bad that you would get an ash stain on your clothes just passing through." Kang Jimin recalls: "Back in the late 90's, when the North's power shortage was at a serious level, Russian technicians came and tried to upgrade the facilities. However, they looked at the station and returned without being able to provide any help, as the layout was from the Czarist Russian-era." "When one of the turbine blades is broken, the temperature of the sauna built in the Pyongyang Thermal Power Station is quite high, close to that of the hot-springs," says Kim Jun Hyok. "This car? They only changed the logo from China's Foton (car company) to their own," says Kim Jun Hyok. "We used to call it the "luxury long-van" but seeing it now, it looks no better than the wagon." 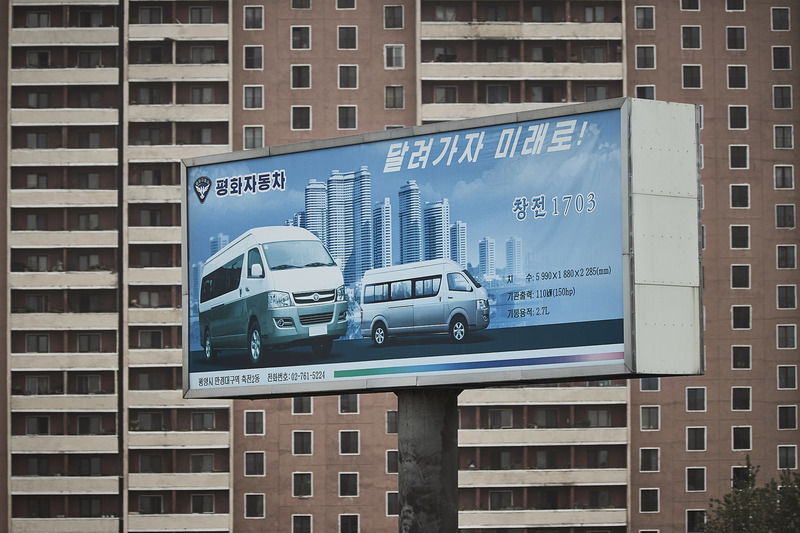 Fyodor Tertitskiy says: Note the apartment complex (the one near Kim Il Sung square) seen on the background of the advertisement – the DPRK state loves to use it everywhere." 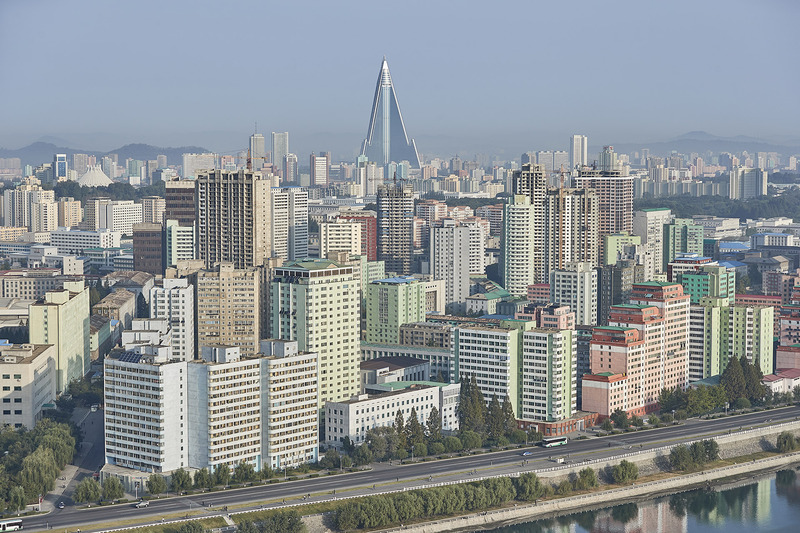 "Built in 1980s and recently renovated, the Ryugyong hotel is the tallest building in Pyongyang," says Tertitsky. "I've heard from some people that the structure of the hotel is flawed and thus it can never be opened unless the whole structure is rebuilt." 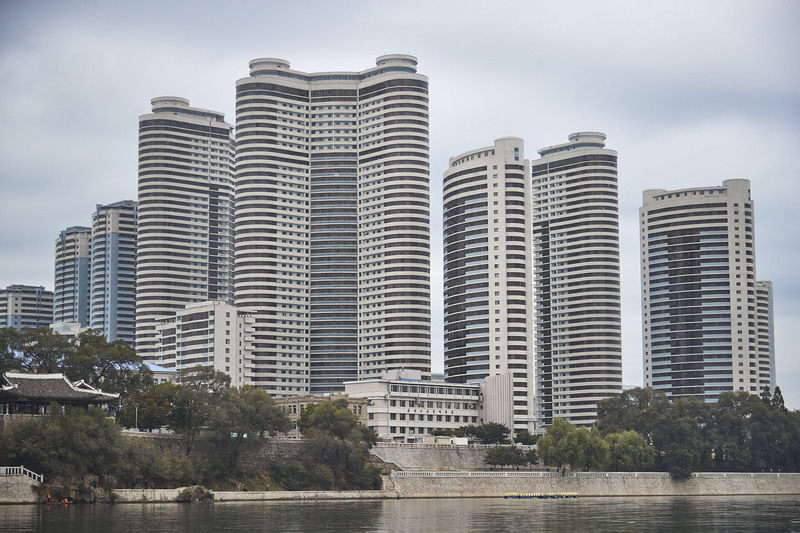 "Ryugyong Hotel, the most hideous building in Pyongyang," says Kang Jimin. "When Jang Song Thaek was still alive, many of these dump trucks – fully loaded with coals – used to roll down the roads, destroying them at the same time," remembers Han Song Chol. "As a result, some people from Pyongan province even tried to block the roads to stop these vehicles from entering. "The North Korean roads are not built to sustain the stress coming from such heavy vehicles like you see in the picture. 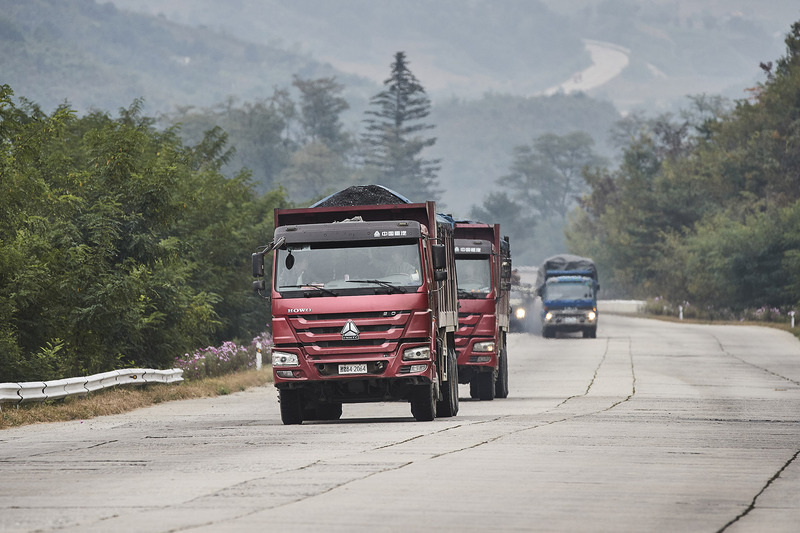 But after 2010, Jang Song Thaek's trucks destroyed many parts of the road as they trembled." This is the Man Gyong Bong Ho, North Korea's only cruise ferry," says Kang Jimin. "This ship used to travel between Japan and North Korea. 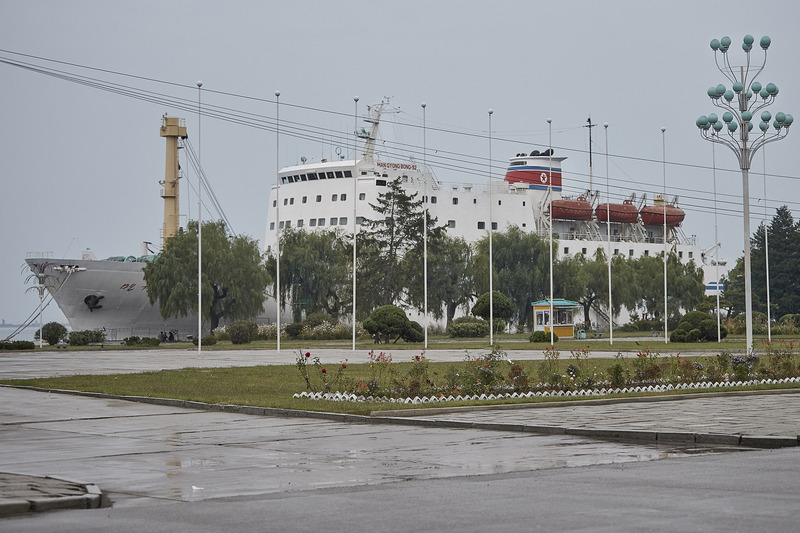 Many Chongryons (Japanese Koreans) were fooled by the Pyongyang government and landed in the North on this ship. As a result, the ship is said to be made of Chongryongs' tears of blood, for those people who arrived in the North were prevented being able to return to Japan. "I don't think anyone who arrived in on the ship would say that life in Japan was worse than the one in North Korea." "This guy is a "Daehaksaeng gyuchaldae", or a university student disciplinary officer," says Han Song Chol. "There are many of them in Pyongyang. 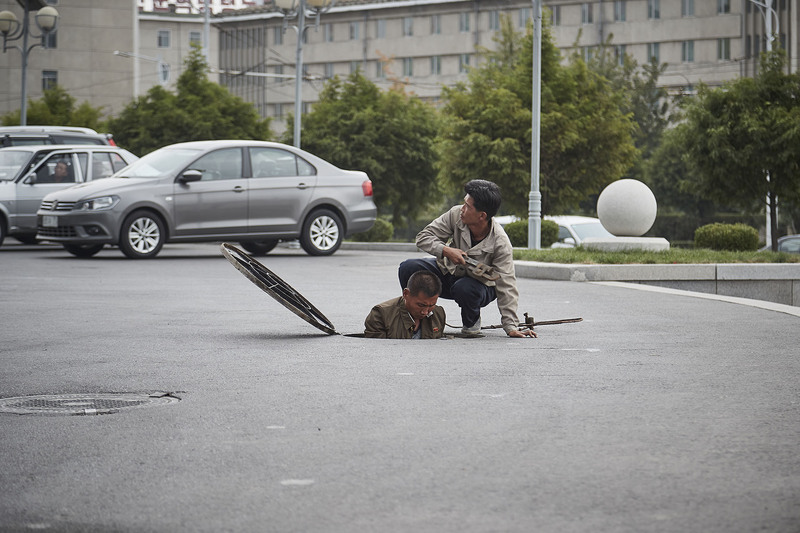 They mainly target women, which is why women in Pyongyang might face some "difficulties" in the streets. Their job is to regulate women who are wearing pants or clothes that are too colorful." "Why are North Korea university students still wearing school uniforms?" asks Kang Jimin. "No one knows and it is so uncool they have to wear these “unchic” uniforms even in university, after all those years spent wearing them in middle and high school!" Fyodor Tertitskiy: "Japanese" usually means "of highest quality" in North Korea. As a result, the income of these people is probably seriously above average." 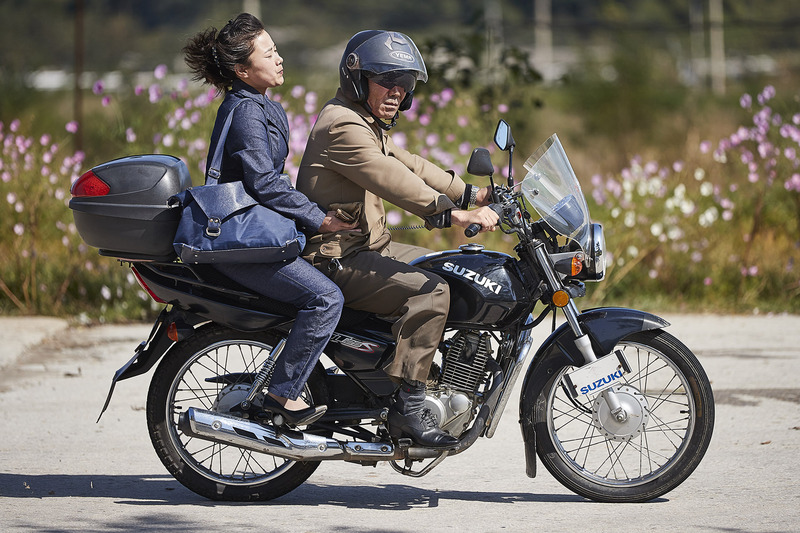 Kang Jimin says "the fact that the women is not wearing a helmet shows hows how much North Koreans are ignorant about safety." But he agreed about the cost of the bike: "that a Japanese second-hand motorcycle is in the North shows that these people are quite wealthy." "A man being dragged by a woman!" says Kang Jimin. 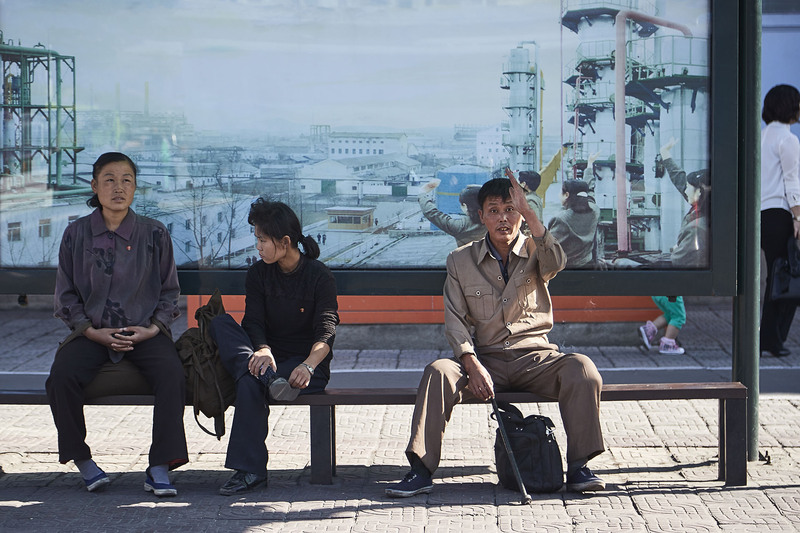 "I would say this is a good portrait of North Korean society today: the man, who has to show up to work even if he doesn't get supplied with any food, and the woman, who has to feed the whole family. 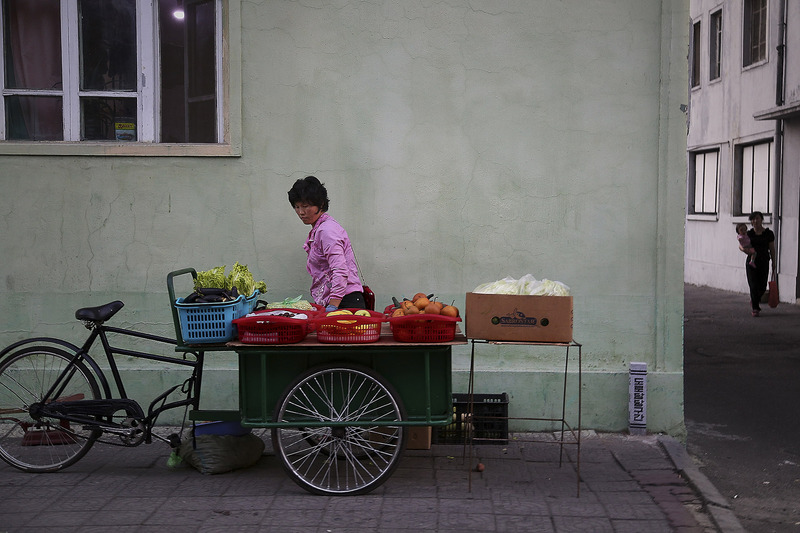 "I think about 70 percent of North Korean men would have died of hunger without the help of their wives or mothers." The Women's League," says Han Song Chol. "These women will have a lot to complain about as they have to take part in propaganda activities like this, do the house work, and take part in other social activities as well." 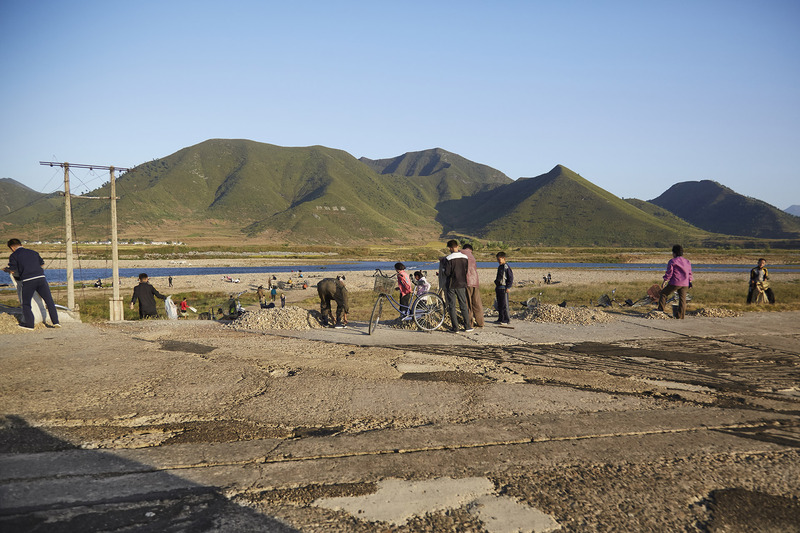 "There is an old Korean saying that 'even the mountain and river changes after a decade,'" says Kang Jimin. "However, in the picture, it looks like the North is frozen in time. Decades of the same propaganda on Chollima, Songun politics, and fidelity to the Kim family. Will the North Korean Spring ever arrive?" "When I was a student, I remember being drafted to work in the fields during rice-planting season," remembers Kang Jimin. "Female students who used to scream even at the sight of leeches would soon get used to the environment, to the point where they would not be surprised to see a thick snake passing by them." "This is a mobile propaganda vehicle," points out Han Song Chol. 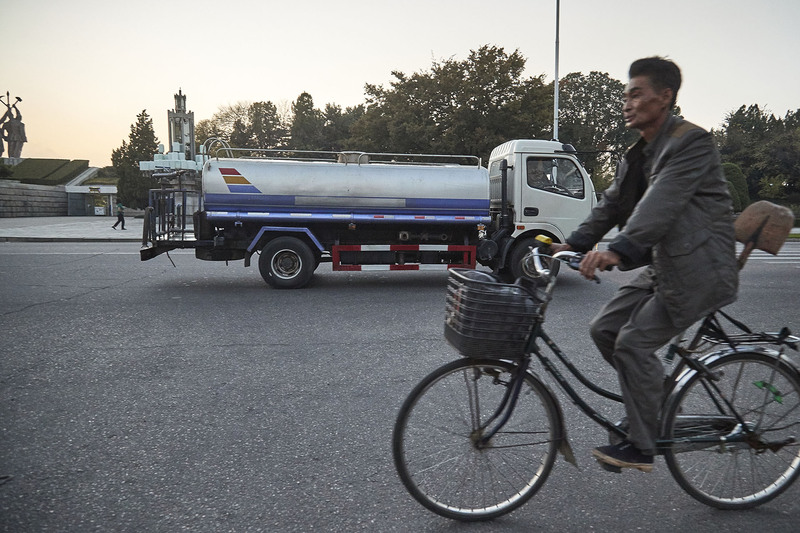 "Due to shortages in gasoline, there are man-powered vehicles like this. In the countryside, during the spring and fall farming seasons, the North engages in propaganda activities using vehicles like this." 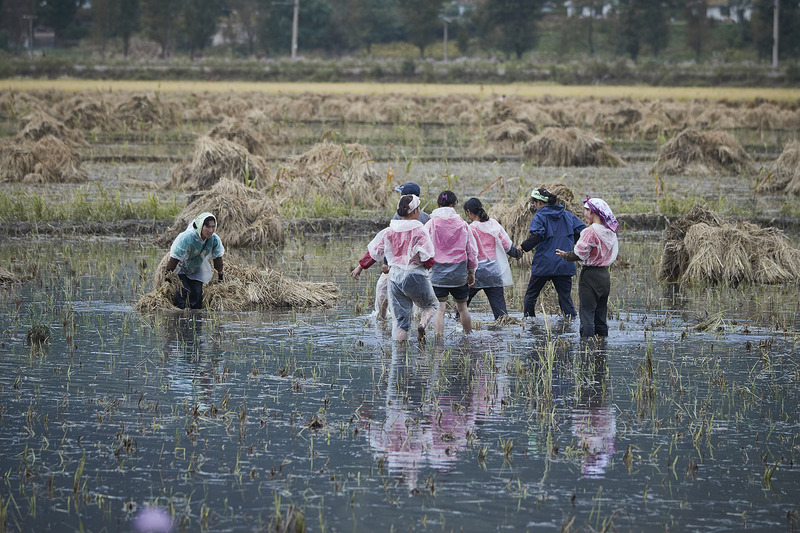 "As North Korea is short on farming machines, most of the work is done through manpower," says Han Song Chol. Note the presence of the crouching soldiers, even in rural areas. "Those dried branches will most likely be used to heat up the room for the elders or used to boil someone's dinner," says Kang Jimin. "But at the same time, North Korea's mountains are becoming more barren every day because of deforestation like that." 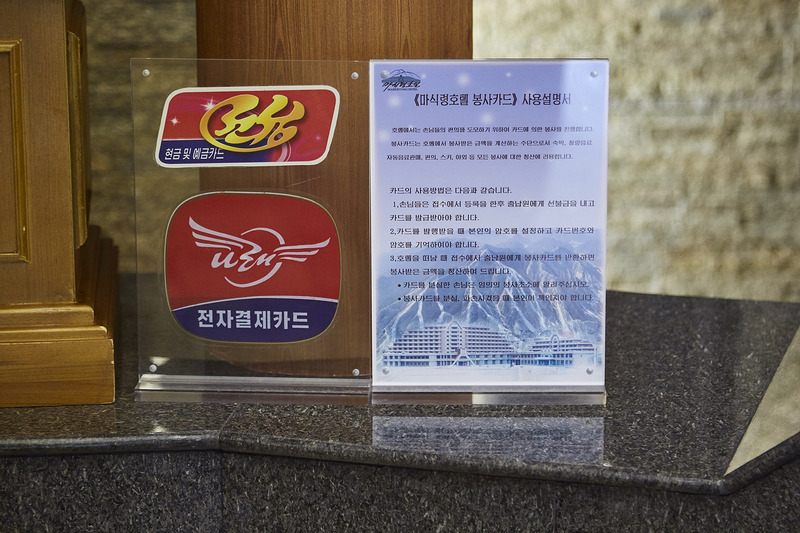 "The sign says that they accept cards for payment, not just cash," says Tertitskiy of a payment processing point at North Korea's Masikryong Ski resort. "One may notice the difference between North and South language - 봉사 means "business" in the North, while in the South it refers to work you do for free as a volunteer." "It looks like I'm looking at a South Korean student doing part time work at a convenience store," says Kang Jimin. "Ten years ago, cell phones were not the kind of item that anyone could use. They cost over a couple hundred dollars, and the phone bill was more than double a landline bill," he says. "Many cell phone owners just used them to receive calls." "I think these men are waiting to be picked up by the "Beoricha," the car service that takes people to the workplace," says Han Song Chol. "As transport options are not that great in the North, they would wait for a ride on the Beoricha that might or might not pass by the road. If unlucky, they would have to wait there the whole day. It is also possible these men are returning to the city after purchasing grains from the rural area - where they are usually cheaper - and waiting for the car to arrive." "When the supply of pebbles for construction sites reaches a low, then the government orders the people to provide more," says Han Song Chol. "Without having many options, the elders or children would go to the riverbank and collect pebbles." Kang Jimin spots something depressing, though: "It is sad to read the propaganda letter written on the mountain which says "save the forest." Where is the forest left to save and protect?" "This is the May 1st Stadium on the Runra Island, opened in 1989," says Tertitskiy. "It is big enough to hold around 150,000 people," says Kang Jimin. "I remember seeing young students who were performing in that stadium during the cold winter, with nothing but a thin layer of performance clothing. "It was also horrible to see the toilets which were all clogged at the time." 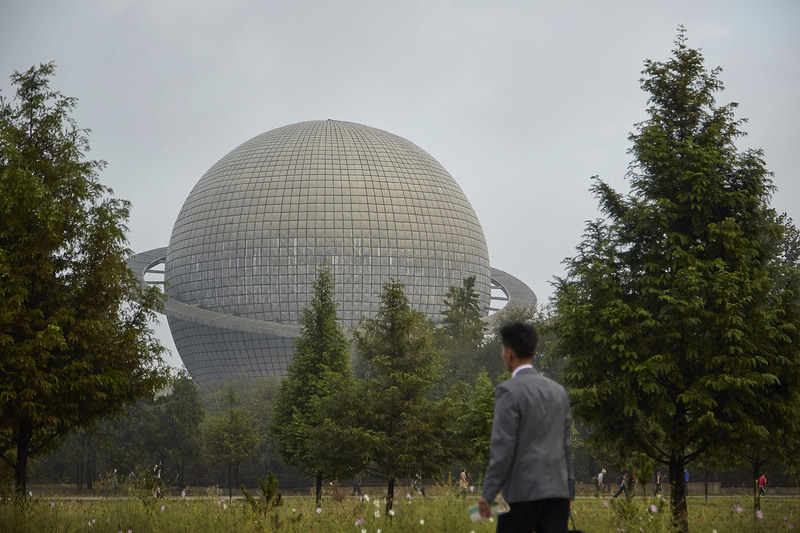 Kang continues: "I think this building quite well symbolizes North Korea, where the beauty seen outside has a huge contrast to what is seen from the inside." (Since Kang left the building has since been renovated on the inside). Can you see the colonial architecture? "Note the house on the right, where multiple apartments share the same balcony," points out Tertitskiy. "This design can be traced back to the colonial era." "The slogan says: "Glory to the great Juche idea! ", but, as you can see, no one is reading it," says Tertitskiy. 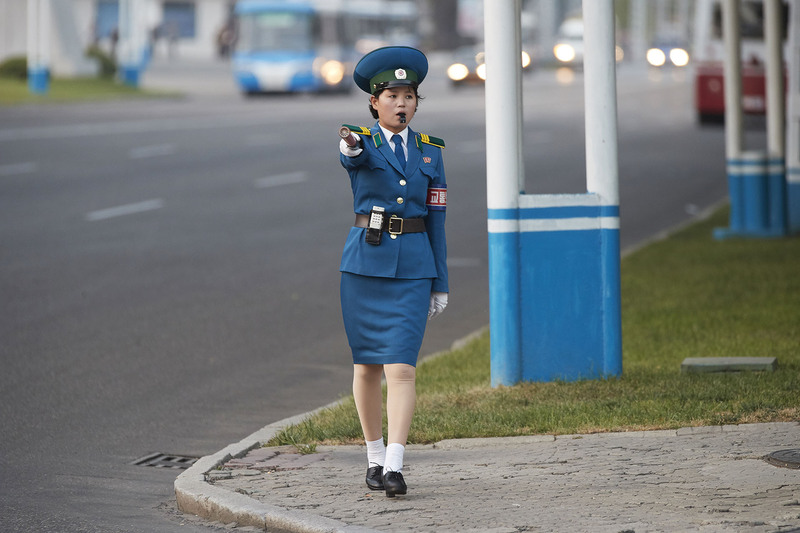 "Unlike most of the world, North Korean girls like corpulent man, since being slightly fat means that you are probably rich," says Tertitskiy. "However, there are limitations to this phenomena, and while this man would probably be quite popular with ladies, those who are as fat as the Supreme Leader, probably would not." 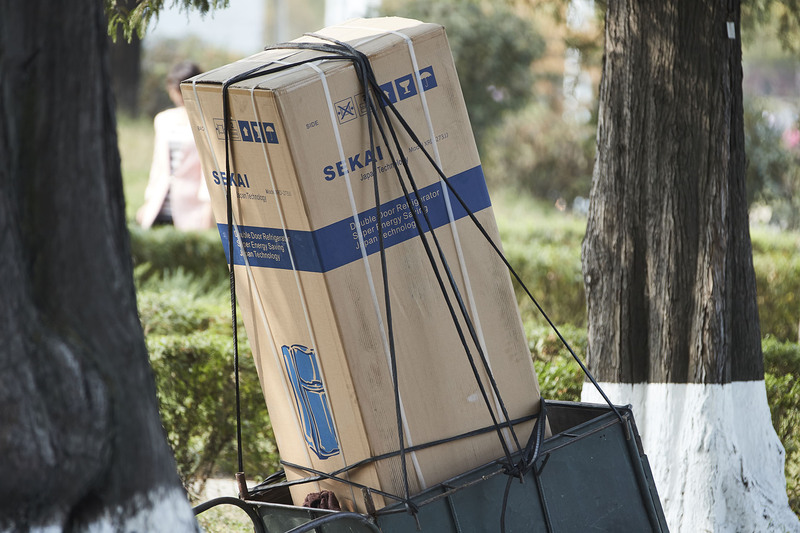 "Owning a fridge is a sign of being rich in North Korea," says Tertitskiy. "Sometimes people buy them even if they don't have power supply!" 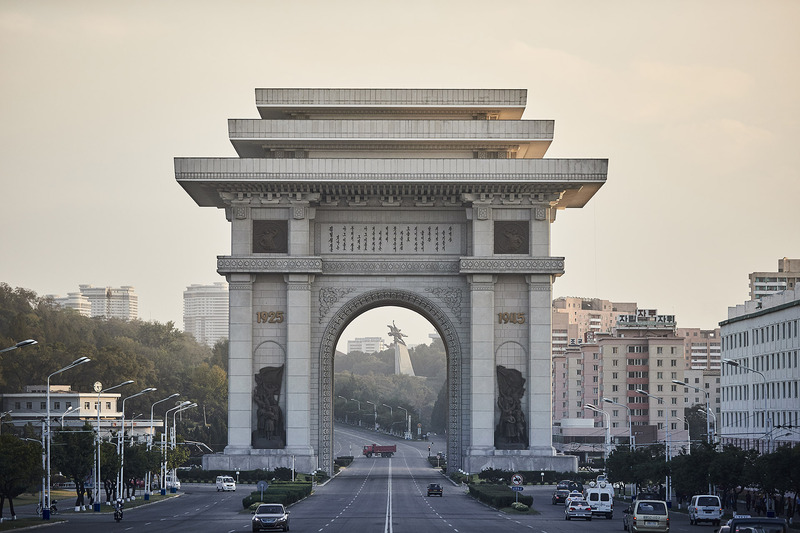 "The Arch of Reunification, located at Tongil Street, Nakrang-guyok, Pyongyang," says Kang Jimin. "This is also the entrance to the Pyongyang-Wonsan highway." "Like the South, North Koreans drive on the right side," says Tertitskiy. "This was introduced after independence, as colonial Korea drove on the left, just as mainland Japan did." 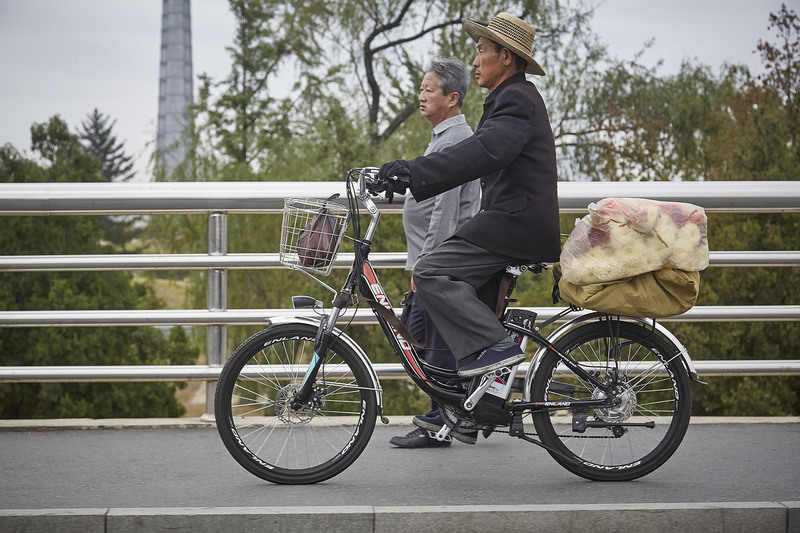 "It's is not widely known, but bicycles are extremely popular in North Korea, the country is almost swarming with them," says Tertitskiy. "It is a quite convenient and cheap way of transporting things and as a result, bikes are used by traders, as well as commoners." "Kim Il Sung square in the sunset--I remember the days when I sat on the bench looking at the square with fear and desperation in my mind," says Kang Jimin. "The streets of Pyongyang were where I spent my youth and were filled with both passion and agony." "The man on the right is doing the greeting gesture of the Korean Children's Union: "Hansang Junbi", or "always ready". This gesture and phrase was taken from the Soviet Young Pioneers," says Fyodor Tertitskiy. "Even with the onset of mobile phones, watches - an old symbol of high income - are quite popular," says Tertitskiy. "Apparently, old habits die hard." "Warning! That Benz Van is a surveillance vehicle from the state political security department (SPSD)," says Kim Jun Hyok. "Under Kim Jong Un, portraits of his father and grandfather became rather standardized: almost all of when featuring the same smiling face," says Tertitskiy. 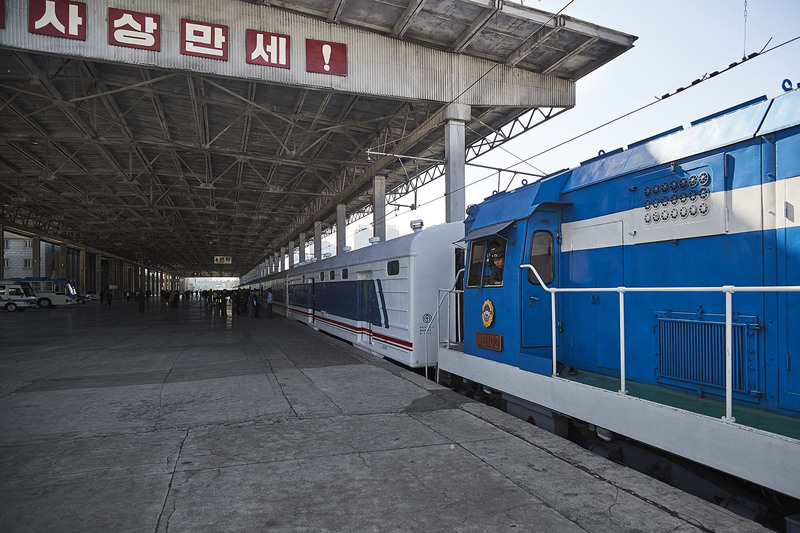 "North Korean international trains are sometimes segregated: there may be separate cars for foreigners and Koreans or for those who go abroad and for those who do not," says Tertitsky. "That's why the first car may not be boarded by anyone." "Wow, the owner of Ragwon Department Store must be working real hard. They remodeled the facility again!" says Kim Jun Hyok. "Kim Jong Un seemingly really cares about the country's image among tourists," adds Tertitsky. "The presence of the English name on the store may be one of the manifestations of it." "These double badges (with both Kim Il Sung and Kim Jong Il portraits) used to be prestigious, but with the rise of Kim Jong Un, became ubiquitous," says Tertitskiy. Notice the 727 number plate, indicating the Audi has been issued to a VIP. July 27th is the day North Korea commemorates its "Victory Day" celebration, the day the Korean war formally ended. 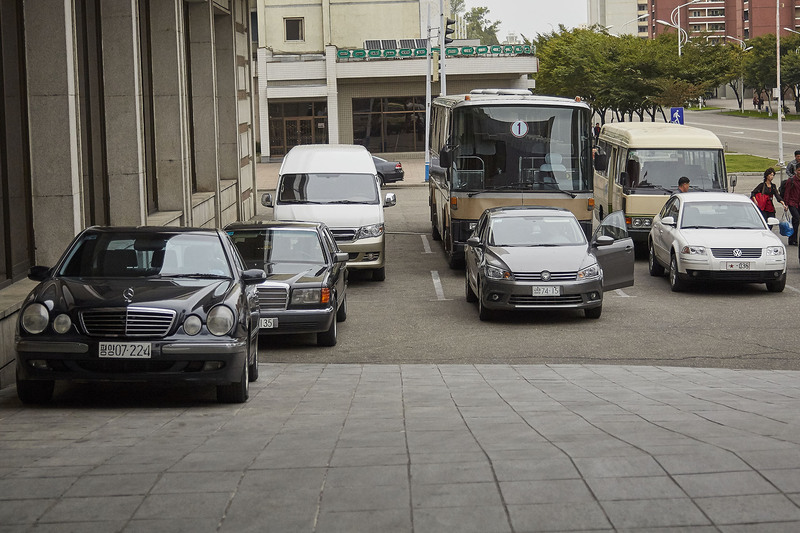 The import of such vehicles breaches international sanctions against the North, but still Pyongyang manages to get hold of such luxury cars. "So, the subway changed as well," says Kang Jimin. "I remember waiting in the darkness when the power was cut amid riding these subways. It felt like I was lying in a coffin." 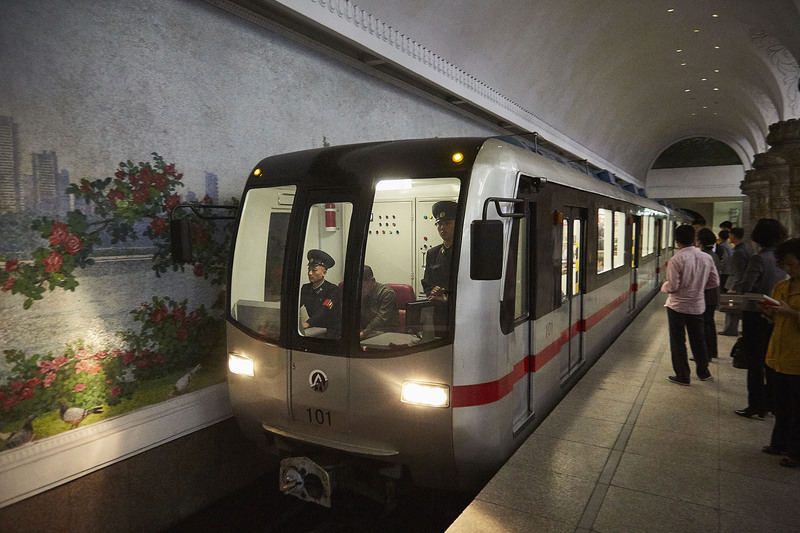 Fyodor Tertitskiy says: "At least in late 2000s, the Pyongyang metro personnel were officially workers of the Department 23 of the ordinary police. Odd, but true." 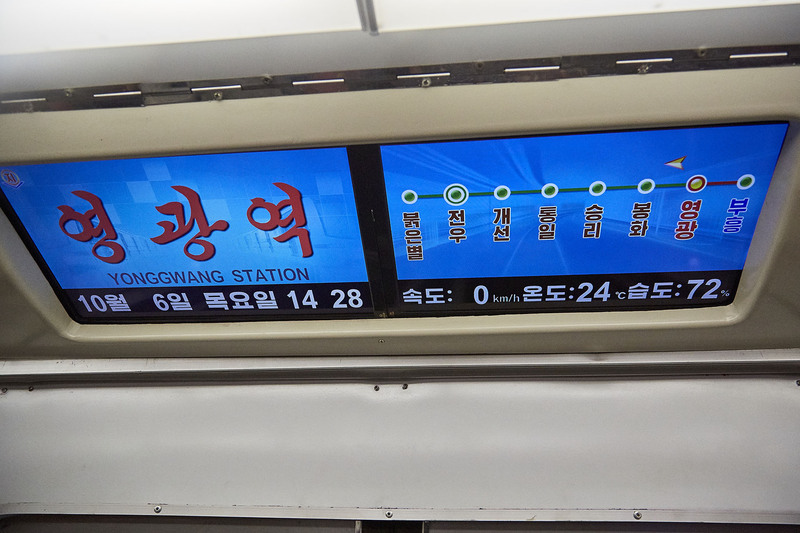 "These new trains were introduced under Kim Jong Un," points out Tertitskiy. "Note the presence of English name of the station, too." 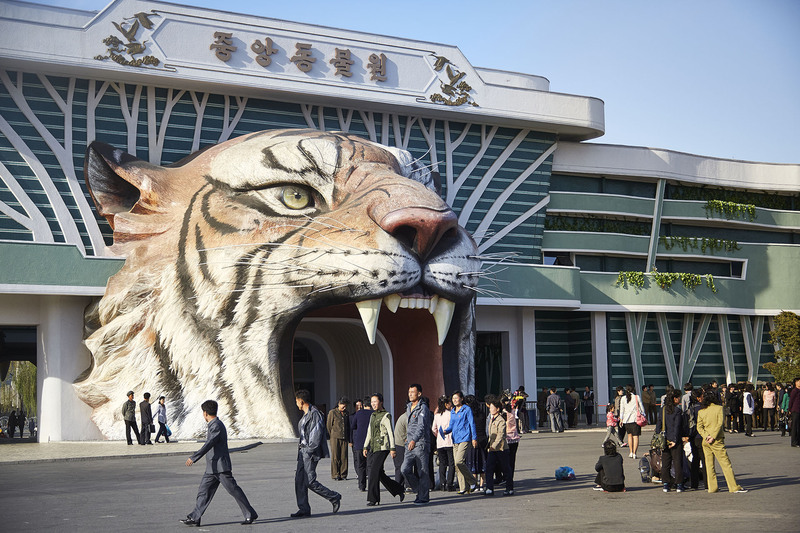 "The Korea Central Zoo located near Mt. Taesong," points out Kang Jimin. "It looks like the facility has recently undergone remodeling. 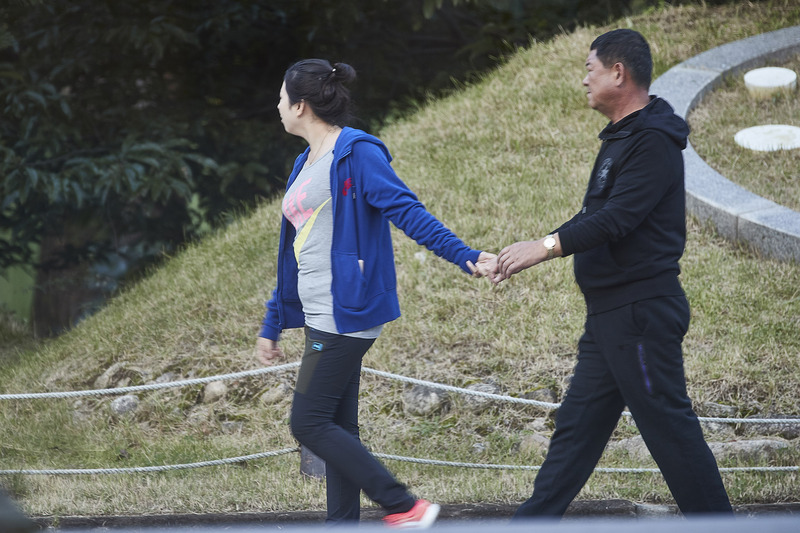 There were once rumors that prisoners executed by the firing squad were fed to the beasts in this zoo…"
"This is where the Chang-jon St., Yeon-gwang-jong and Gip-song-ju-so school is," says Han Song Chol. 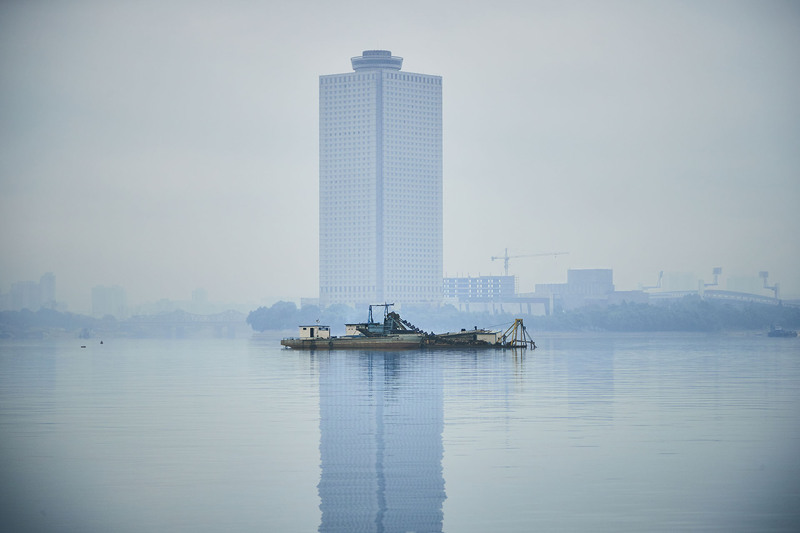 "These buildings were built in such a short time that the residents feel a bit uncomfortable." 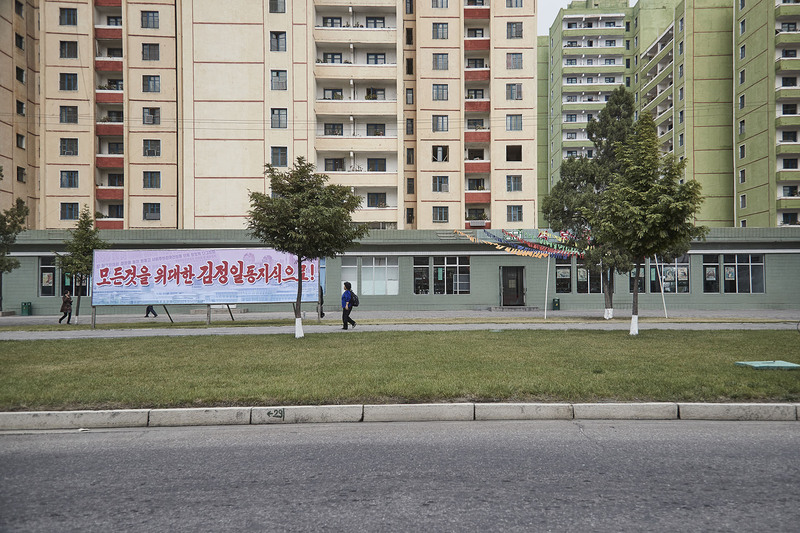 Tertiskiy adds, "North Korean state media absolutely love this newly built apartment complex near the Kim Il Sung square. It is featured in their propaganda publications over and over and over again." "This is the Yanggakdo hotel," says Tertitskiy. "It is a good and comfortable place and also one of the few, if not the only one, which did not experience any electricity shortages." 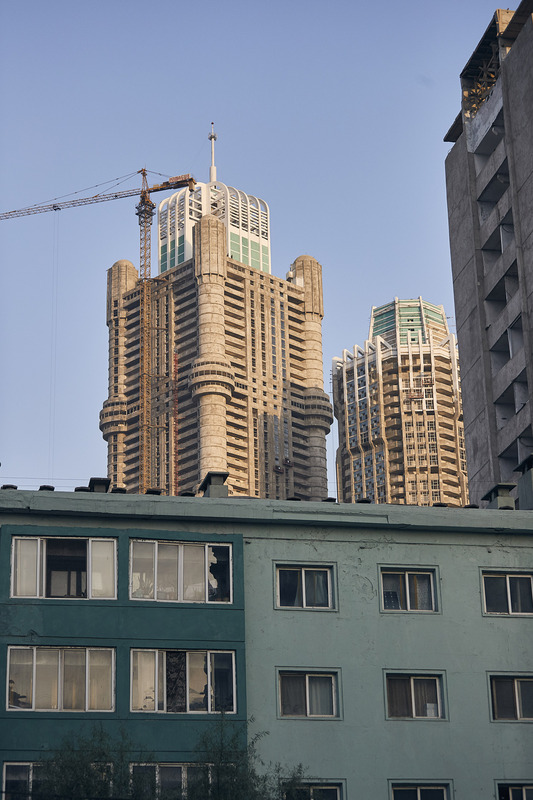 "They built this hotel to earn hard currency during Kim Jong Il’s reign," says Han Song Chol. "However, they still haven’t made enough money to cover the construction cost of the hotel. 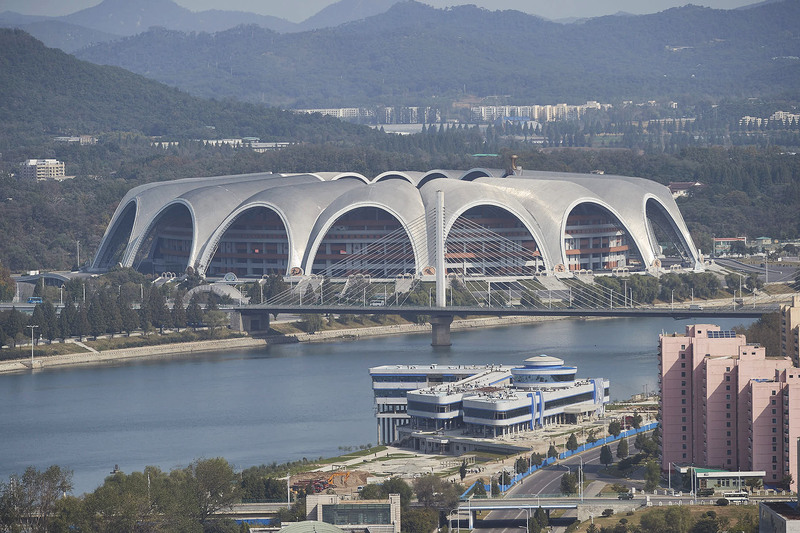 They are currently building the Yanggak soccer stadium and another athletic complex nearby." "This is a railroad bridge between the Taedong River station and Yanggakdo, built in Japanese colonial times but still used today," says Han Song Chol. 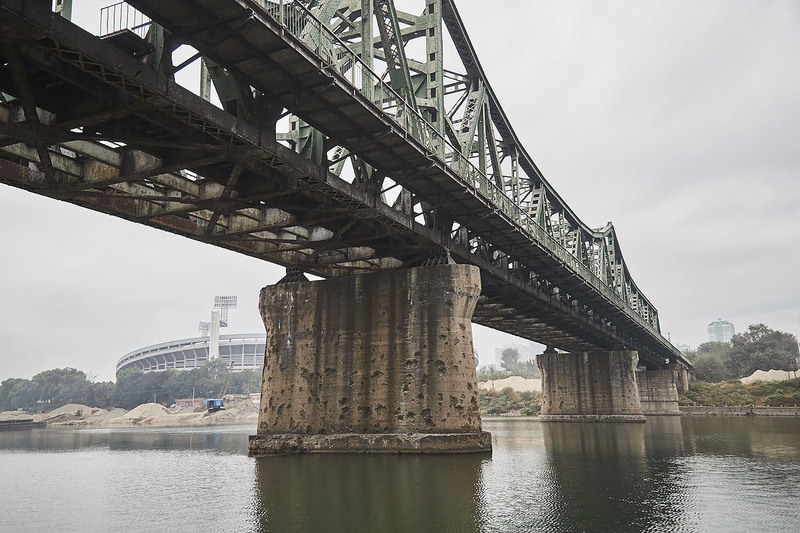 "The bullet holes that you can see below the bridge are from the Korean War," says Kang Jimin. 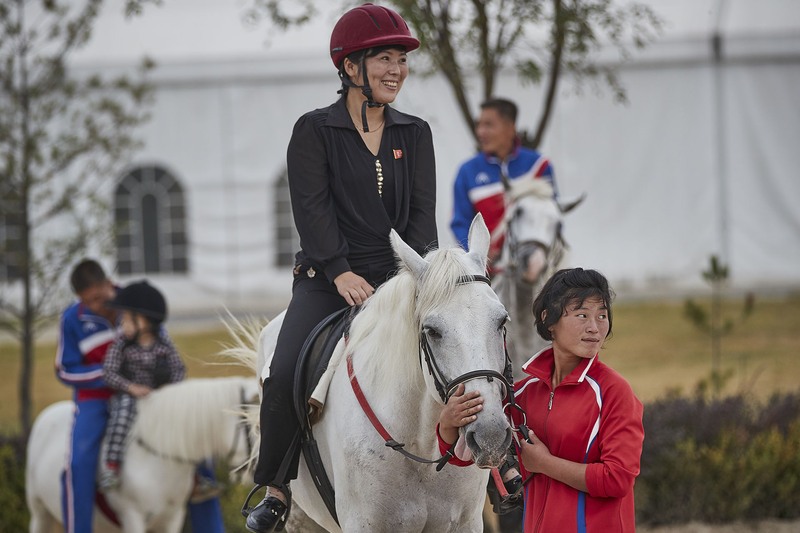 Horse riding at North Korea's Mirim Riding Club, not a past-time for the average citizen of the city. 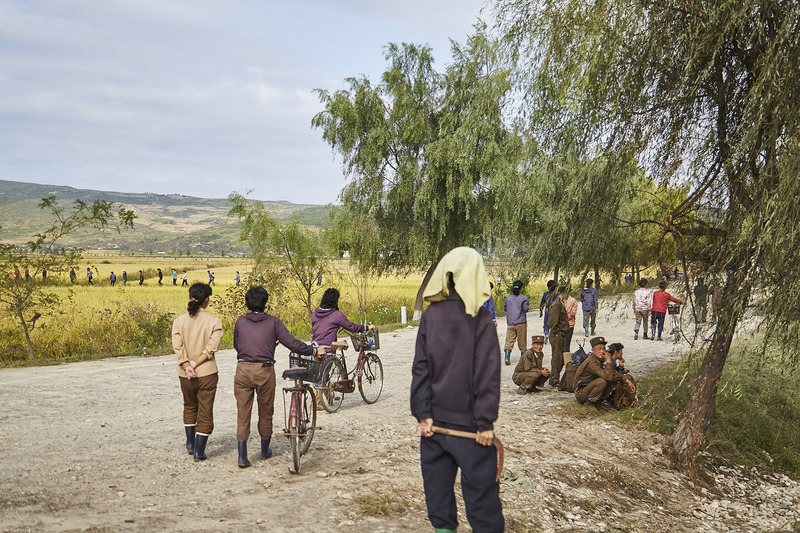 "Here we can see donju (the elite of North Korea) enjoying their time at the Mirim Horse riding Club," says Han Song Chol. "It costs about 100,000 KPW an hour to ride horses. Now, that would be equivalent to a four years worth of salary of a normal worker in North Korea." "These apartments are right next to the Gangan road in Dongmundong in Jung district (central district)," says Han Song Chol. "This is the famous Ongryugwan restaurant, right below the Moranbong. The large group of people in the back are those waiting to get some naengmyeon (cold buckwheat noodles) and probably have been waiting since 10 AM," says Kang Jimin. "Illegal tickets for Ongryugwan naengmyeon became over ten times more expensive than the real price, because people had to wait more than 2 hours minimum to try their food. Anything is good when someone’s hungry!" "Plastic surgery exists in Pyongyang as well Seoul," says Kang Jimin. "Of course, it’s nothing compared to the industry in South Korea. I feel sorry to say this, but it seems like the one on the right has gotten double eyelid surgery." This is an apartment where ordinary citizens live," says Kim Jun Hyok. "In North Korea, these briquettes are called gumeongtan (holed briquettes, South Koreans call them yeon-tan)," says Kang Jimin. "Pyongyangites normally heat up water and cook with gas and oil. However, after the economic crisis, gas and oil supplies were cut off, as was heating. So people had to make personal heaters at home to use for heating and cooking. As a result, coals that needed to go to the power plant decreased by half." "They are selling briquettes, which cost about 1,000 won each," says Kim Jun Hyok. "This boat carrying sand reminds me of something in North Korea called the "Underwater Sand". "It is very odd for there to be a South Korean vehicle in the North," notes Tertitskiy. "Was it imported from China? Even if that was the case, who allowed it? It seems the times are changing indeed." 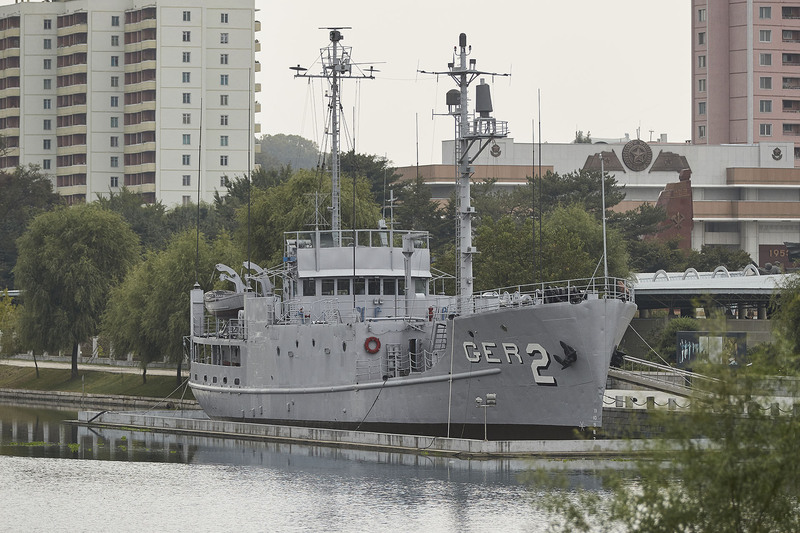 "This is the USS Pueblo, captured by North Korea," says Han Song Chol about the former U.S. naval vessel. "North Koreans have also taken the USS Sherman, which Christian missionaries used in 1866. It was left on the east coast and brought into Pyongyang after going around the peninsula for hundreds of miles." 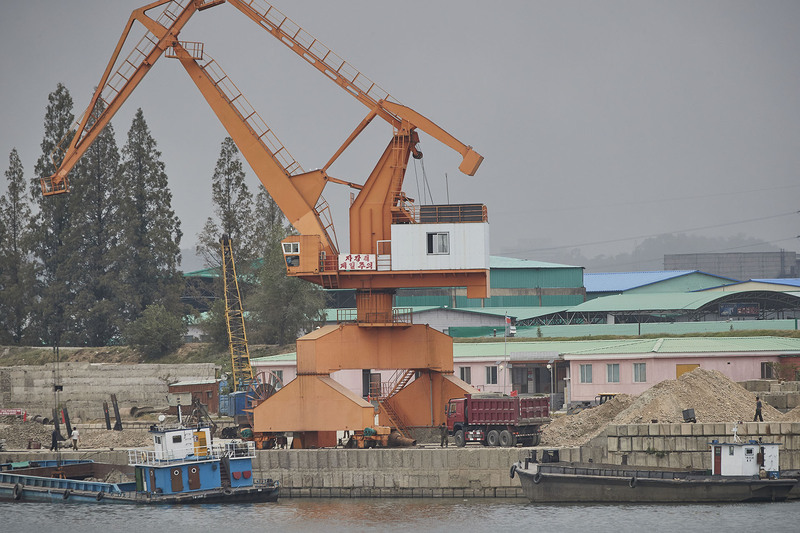 "I am still wondering how they moved this boat from the Taedong River into the Potong River," says Kim Jun Hyok about the vessels' new location. 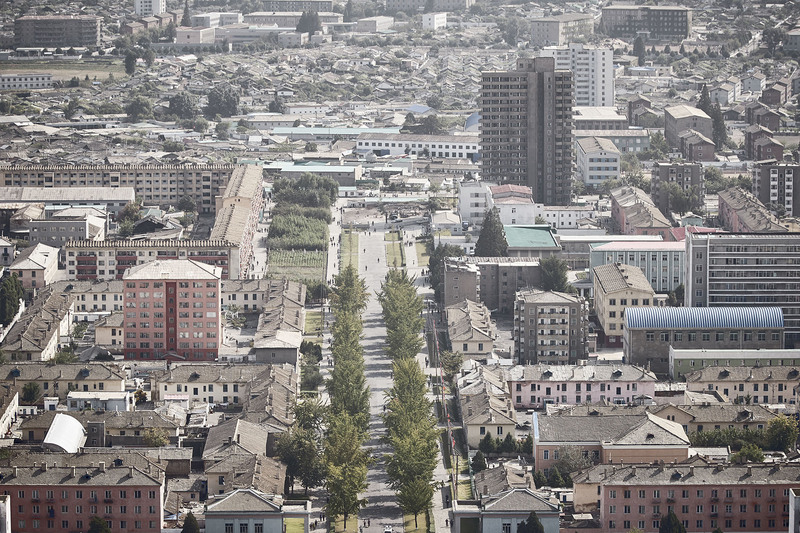 "This is the North Korean version of South Korea's Gangnam," says Kang Jimin. 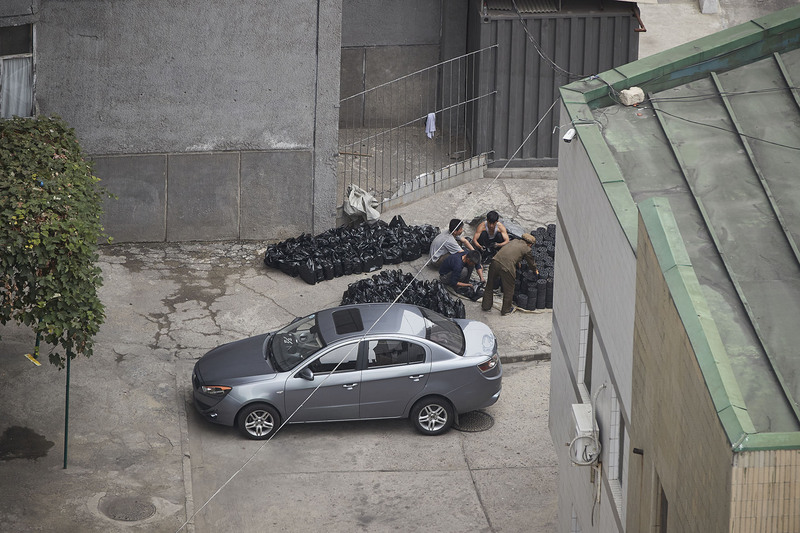 "This is where high party officials’ houses are piled up and is protected by the Supreme Guard Command. "Even if you are visiting relatives who live in this area, you can’t get in without going through a meticulous ID search." "Where else would you see a truck carrying people as cargo like this besides in Pyongyang? Is this the true face of unique socialism?" asks Kim Jun Hyok. Kang Jimin has a differing view, though. 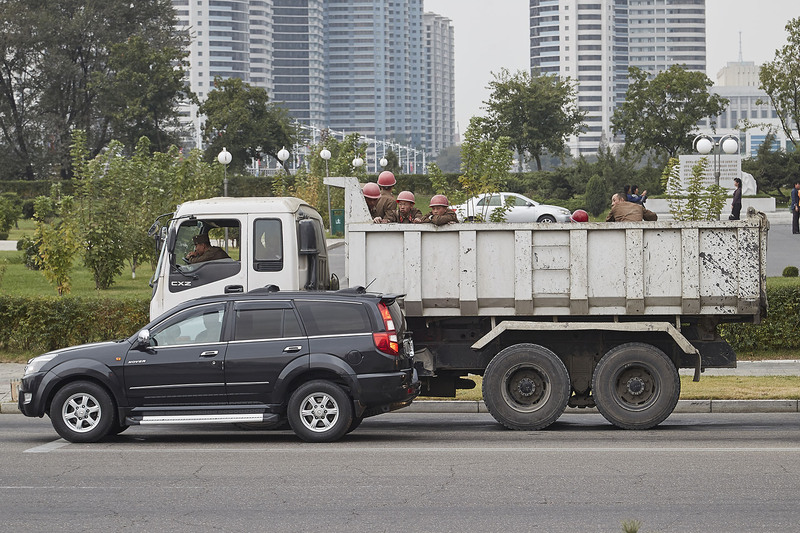 "Giant trucks and Mercedes… North Korea seems like it changed a bit. In the past, I could only see the old sedan models of Mercedes. The most surprising this is that the soldiers who got drafted for construction have safety hats on." "Note that they don’t even have working gloves for a task in the sewer," points out Kim Jun Hyok. "Their hands will have so many scratches!" 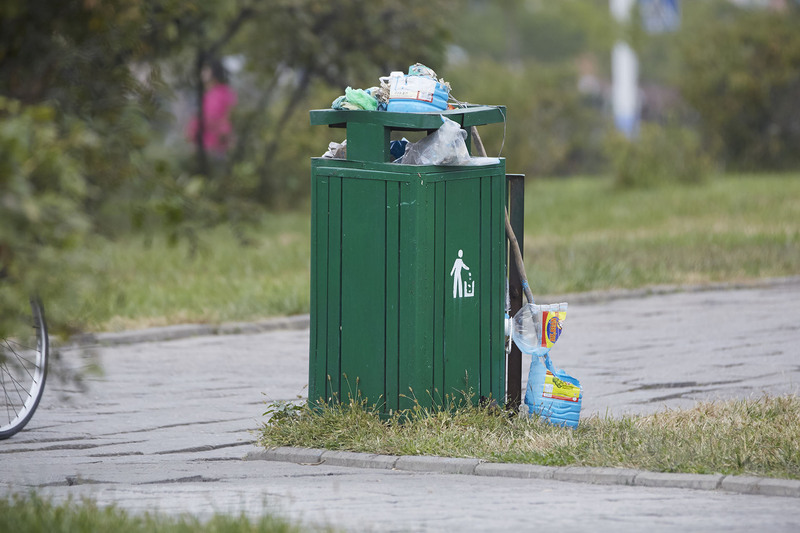 "Waste sorting appears yet to be introduced to the North..," says Tertitskiy. "This fellow must have engaged in a lot of fraud (meaning he has a lot of money)," says Kim Jun Hyok. "That's because he has an electric bike." 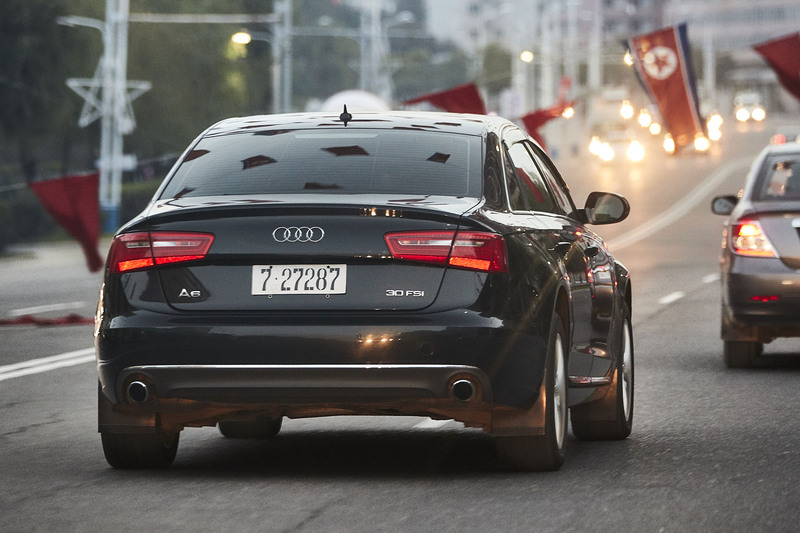 "That white car with a red star in the license plate is better than the 727 number plate," says Kim Jun Hyok. "These are reserved for people who participated in the anti-Japanese movement." 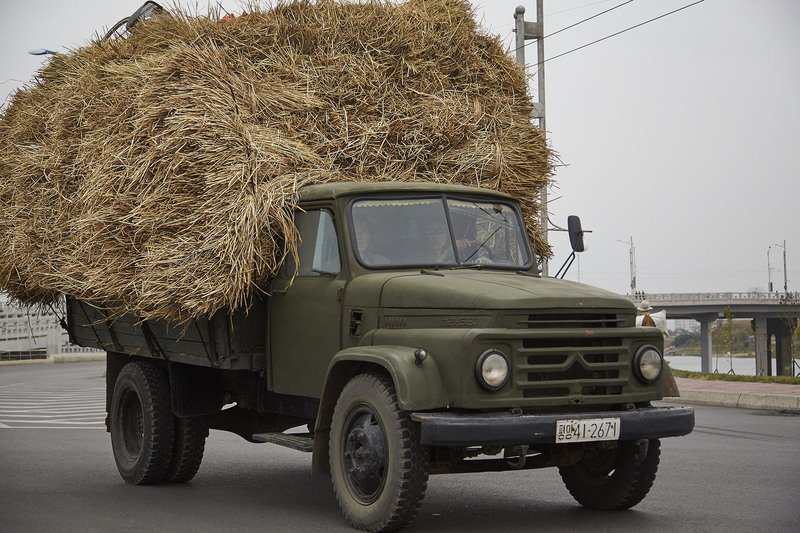 "This truck is carrying chaff to a pig farm. 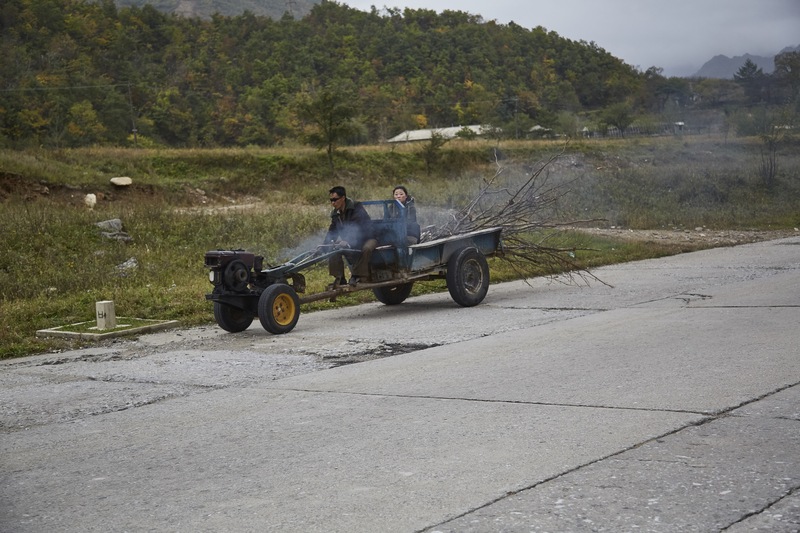 They are still using a truck from 1958," Kim Jun Hyok says. "The fact that this sort of stuff is still running around is a miracle," notes Kang Jimin. "But then again, it's very common to see these vehicles in rural areas." 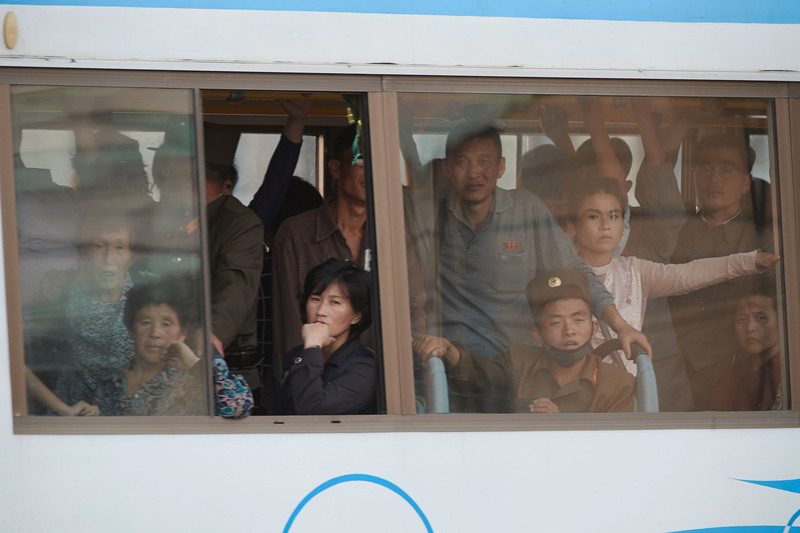 "A photo of hungry, suffering and ragged Pyongyang citizens," says Kim Jun Hyok. "As even Pyongyang is like this, you don’t even need to consider what it can be like elsewhere in North Korea." 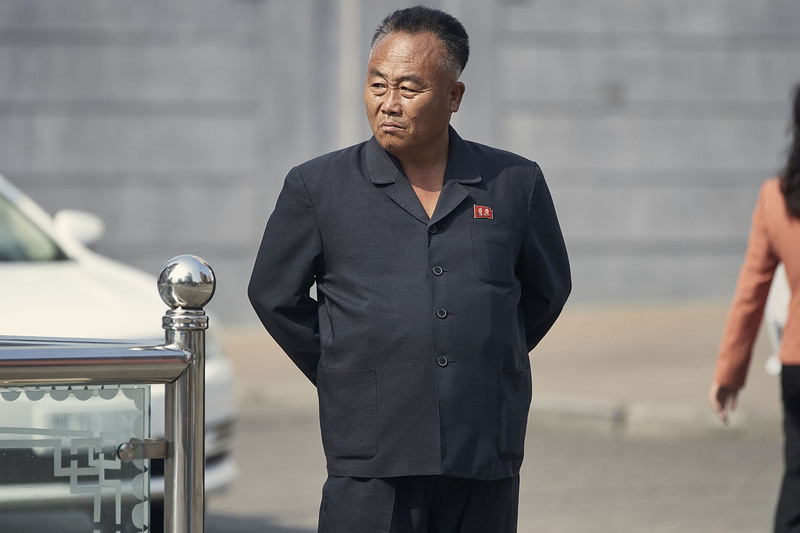 "North Korean inmin-bok (People’s clothes, uniform) and the jumper-style fashion still hasn't changed after all these years," observes Kang Jimin. 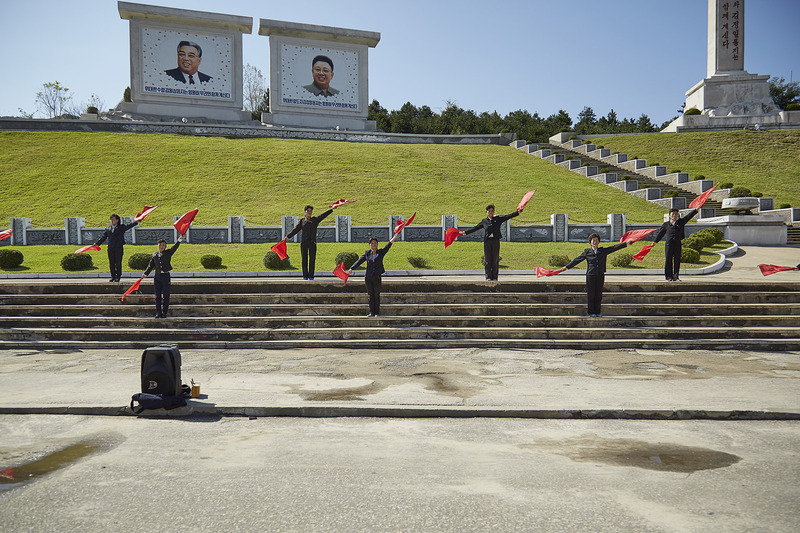 "This is the Three Revolution Exhibition in Pyongyang," says Han Song Chol. The exhibition primarily showcases the three revolutions of Kim Il Sung, the ideological, technical, and cultural. 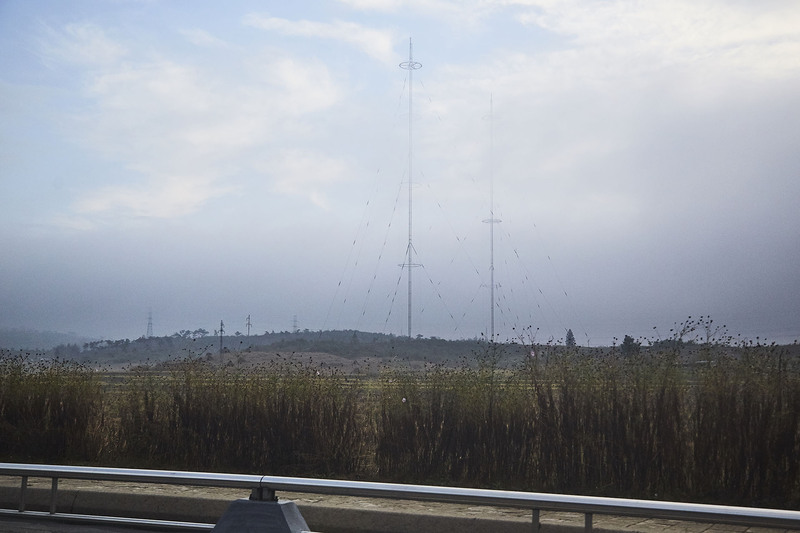 "Note the large antenna is right next to the road...," says Kim Jun Hyok. In 2016, North Korean authorities opened a microlight airport in Pyongyang for local citizens and tourists to use. 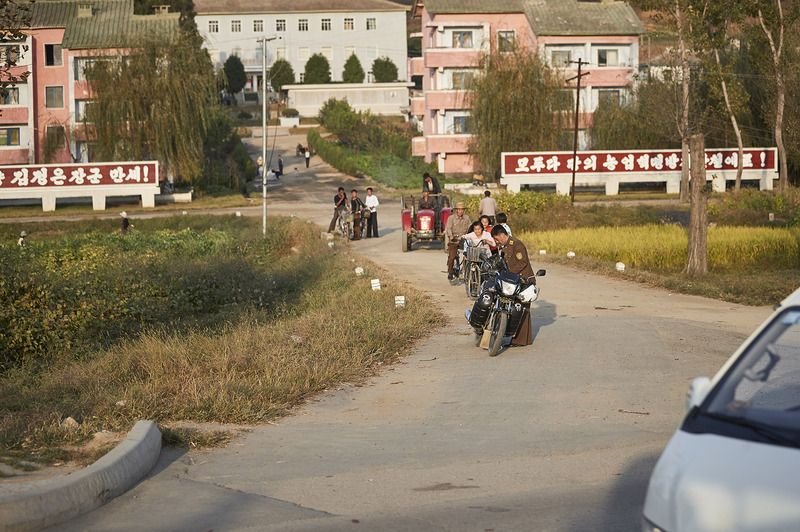 "An increasing number of North Koreans are riding bikes," says Tertitskiy. "Most of the bikes are believed to be imported from China, a major manufacturer of electric bicycles." 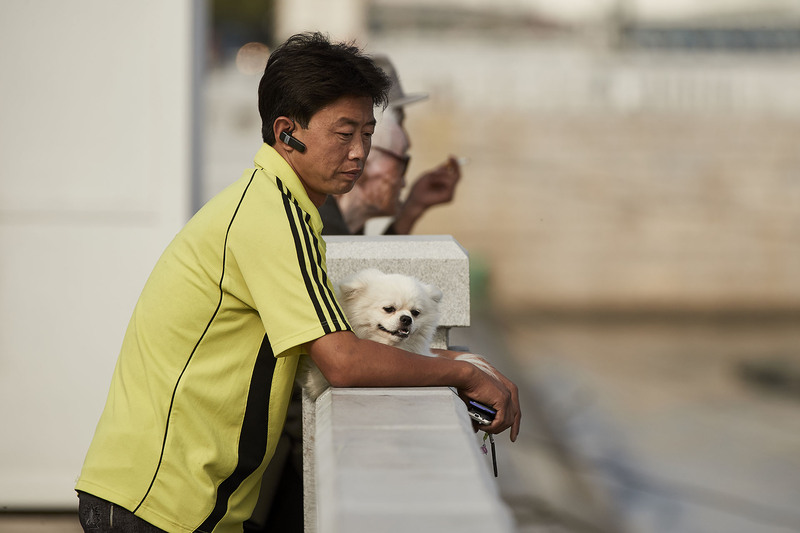 Two phones, a blue tooth, and a pet are all signs of wealth in North Korea. 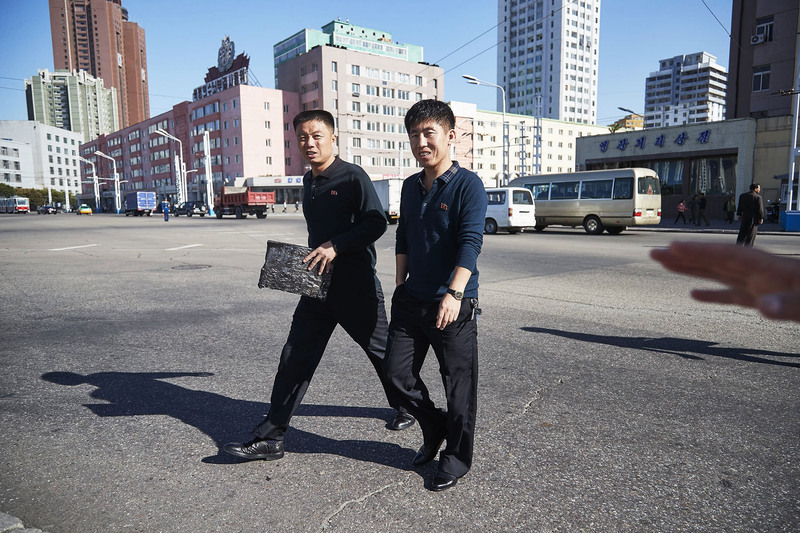 The "donju" or "masters of money" represent the elite of Pyongyang who have reached their wealth by participating in unofficial markets or setting up small businesses. 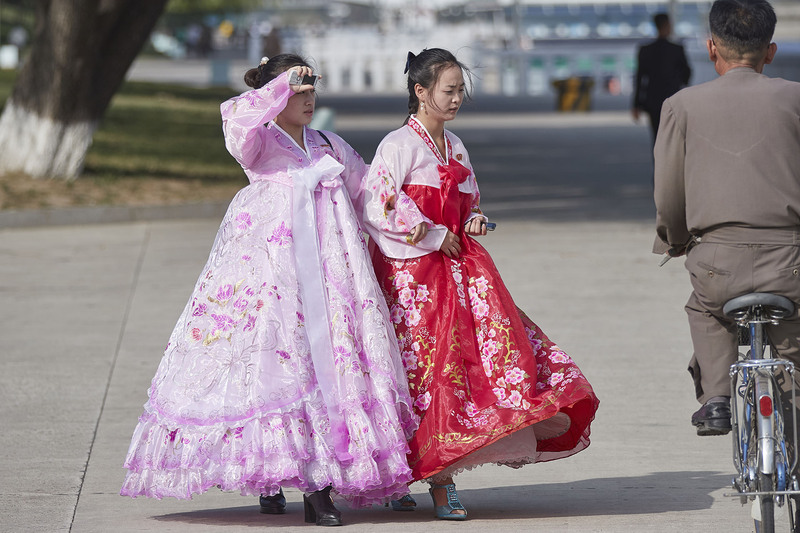 Young girls roam the streets in the traditional dress "chosonot" (called "hanbok" in South Korea). 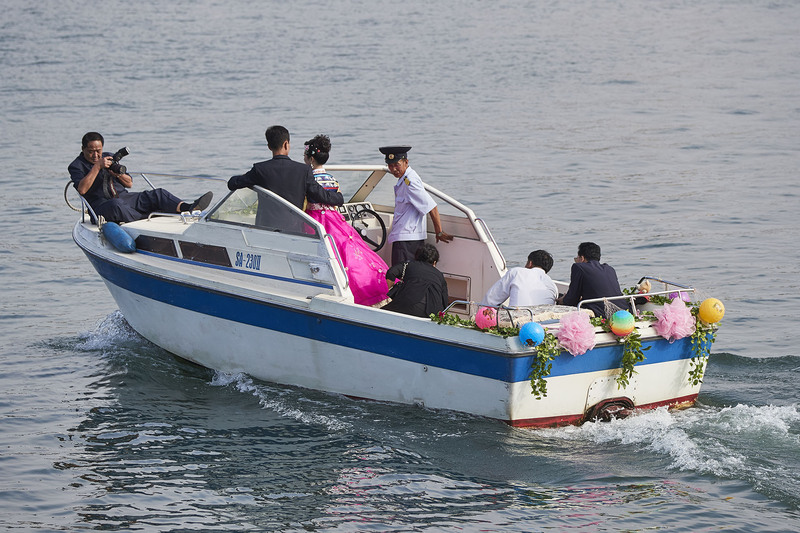 Young newlyweds pose for a photo in the Taedong River. For wealthier families, it is common for couples to have photo shoots featuring national landmarks. 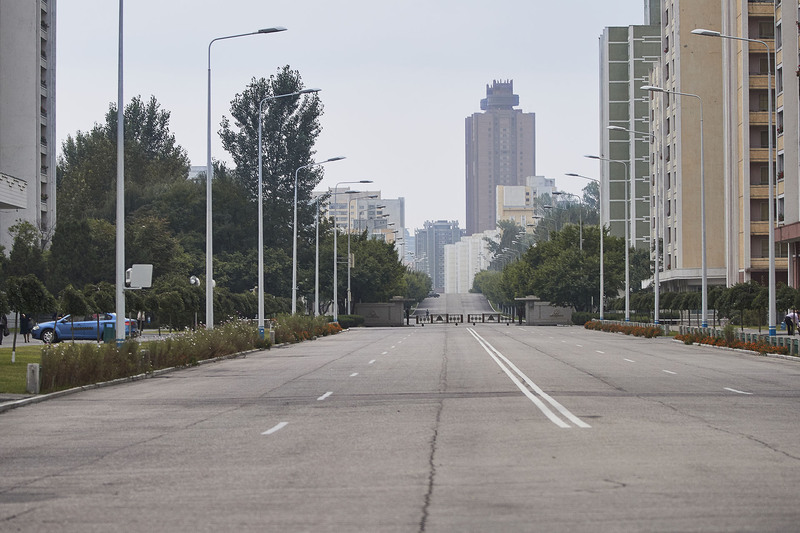 An ambulance drives past a road in Pyongyang. 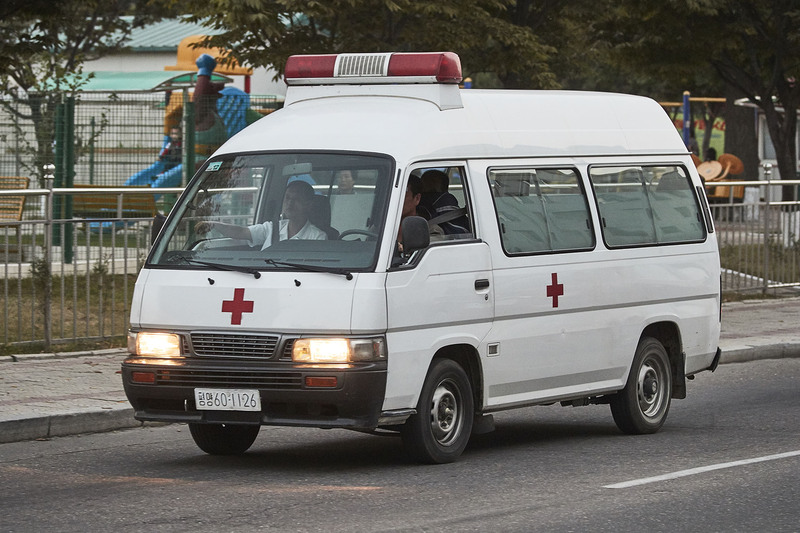 Most reports indicate that while some ambulances do exist outside of Pyongyang, the capital is the only place where they could play an emergency response role. A woman and young man push a cargo of wires along a wet street in Wonsan. While the state once provided rations and supplies to people throughout the country, the public distribution system (PDS) broke down severely during the famine of the mid-1990s. 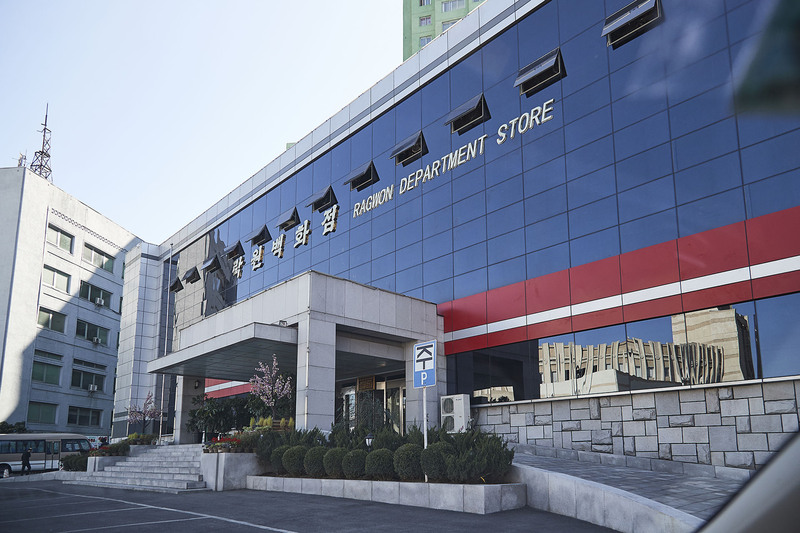 Increasingly, people in North Korea must look out for themselves, meaning many individuals have now entered the field of private trade in order to survive (and often thrive). 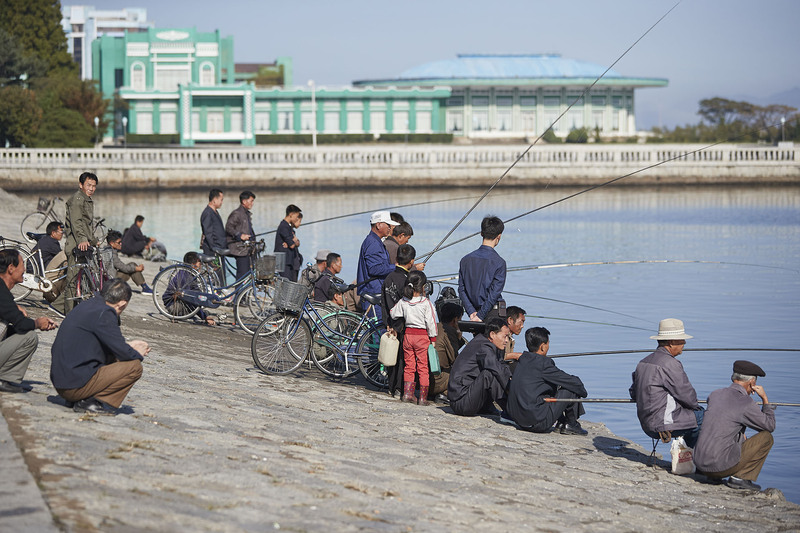 People fish along the Taedong River in Pyongyang, a popular activity for both locals and visitors. 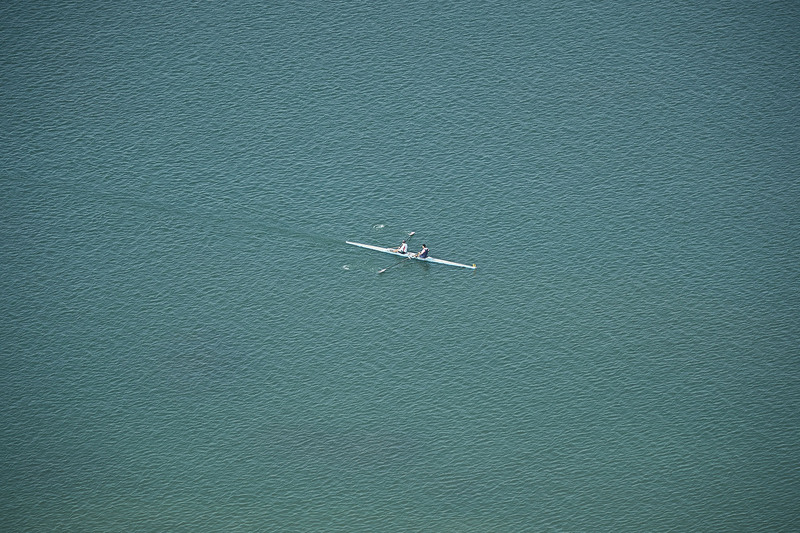 A leisurely kayak in the Taedong River. A woman shields her face from the sun while biking in the capital city. 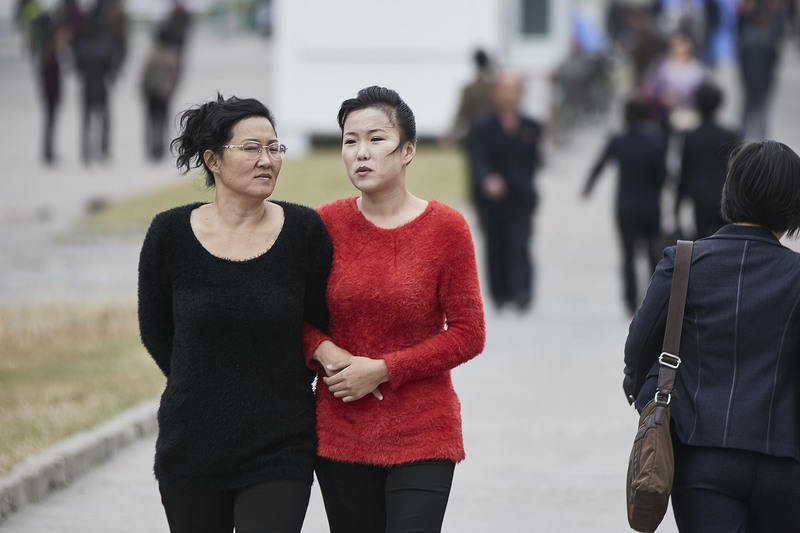 Protecting the skin from sun exposure and maintaining pale skin is a widespread trend and statement of privilege among Asian women that seems to have made its way to Pyongyang. 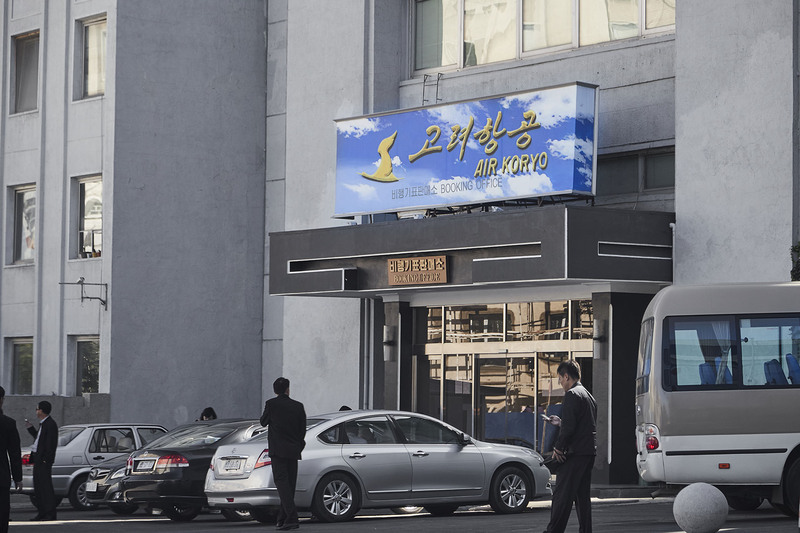 The ticket office of the recently sanctioned North Korean national airline, Air Koryo. The airline has nearly 20 planes, but the vast majority are prohibited from entering Chinese or Russian airspace because of safety concerns relating to the age of the aircraft.